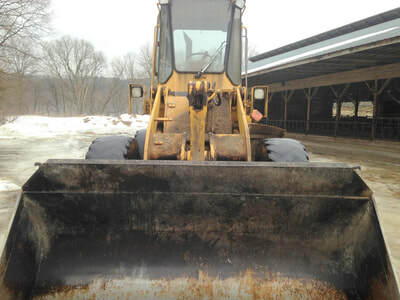 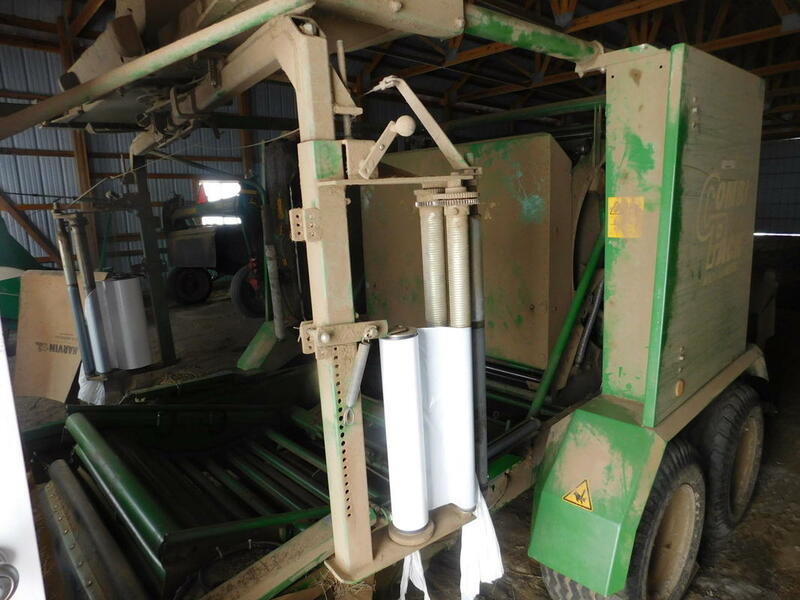 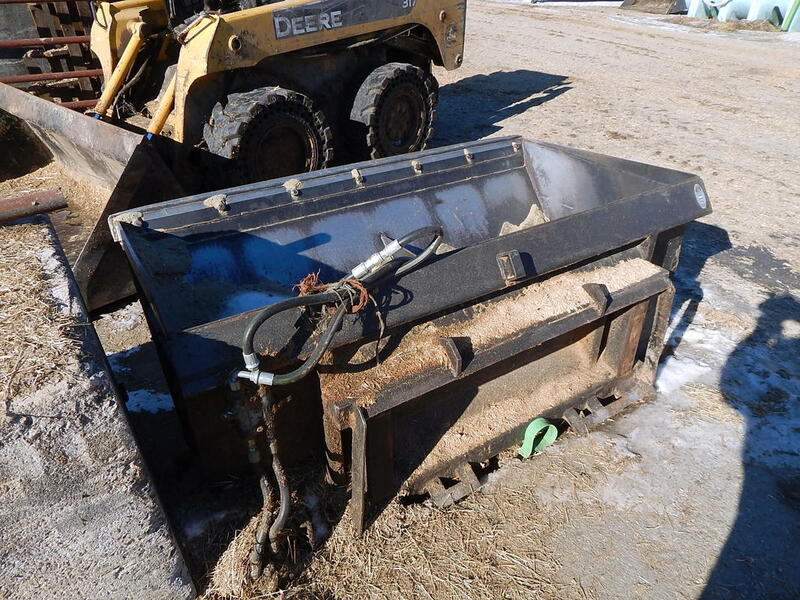 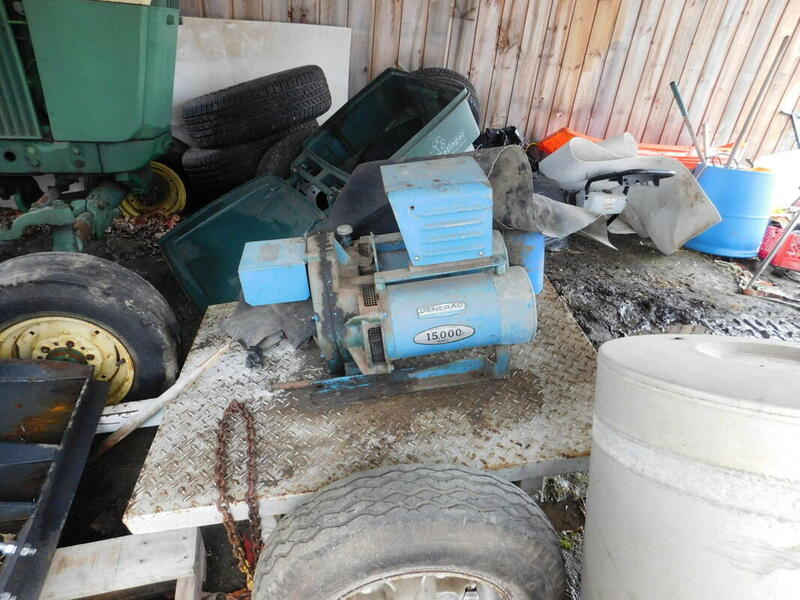 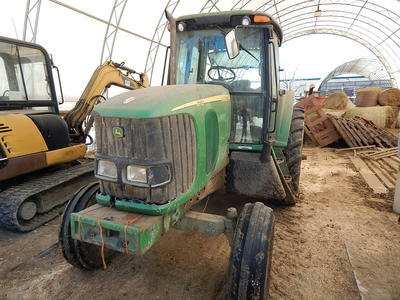 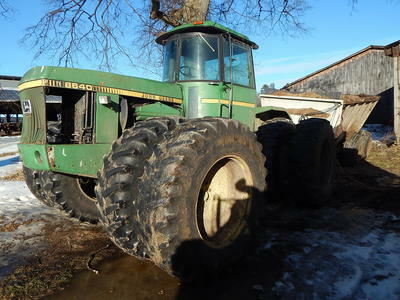 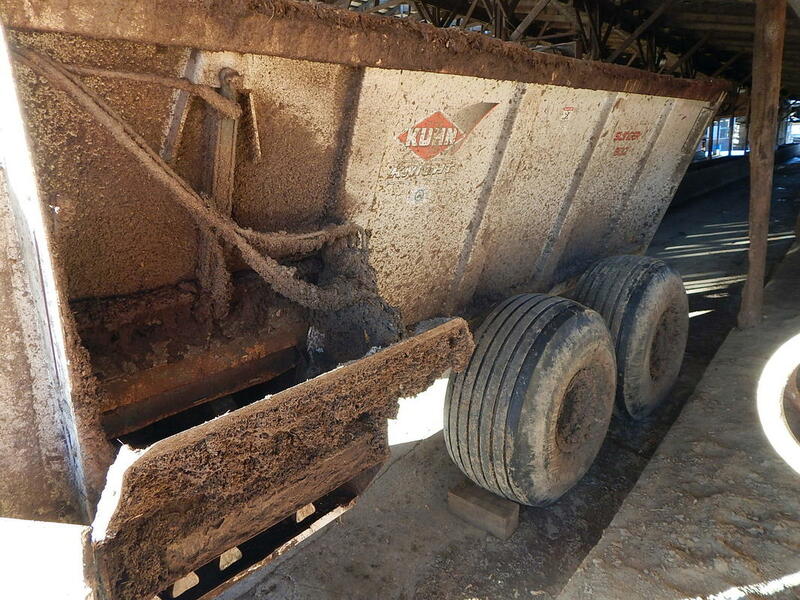 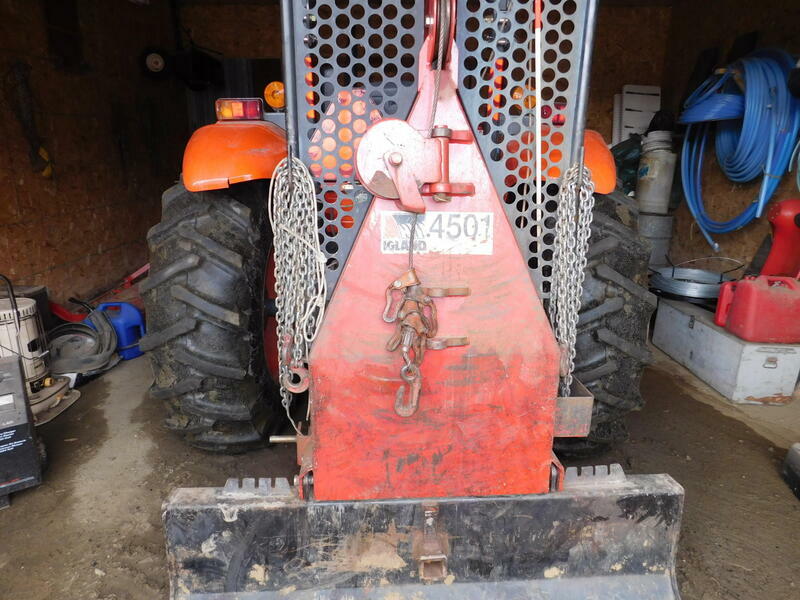 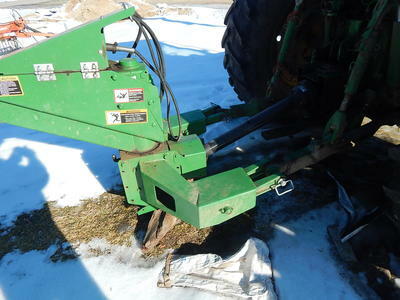 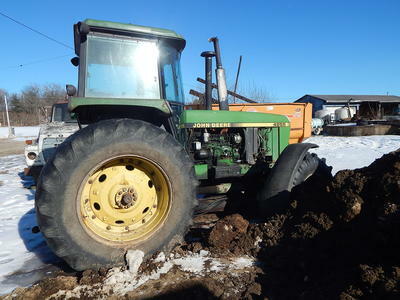 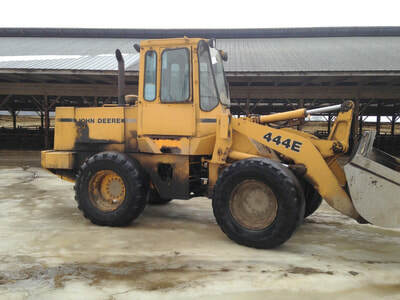 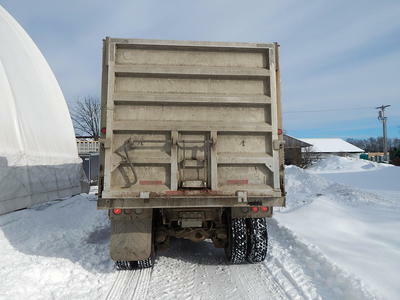 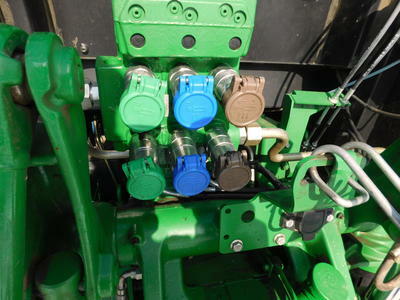 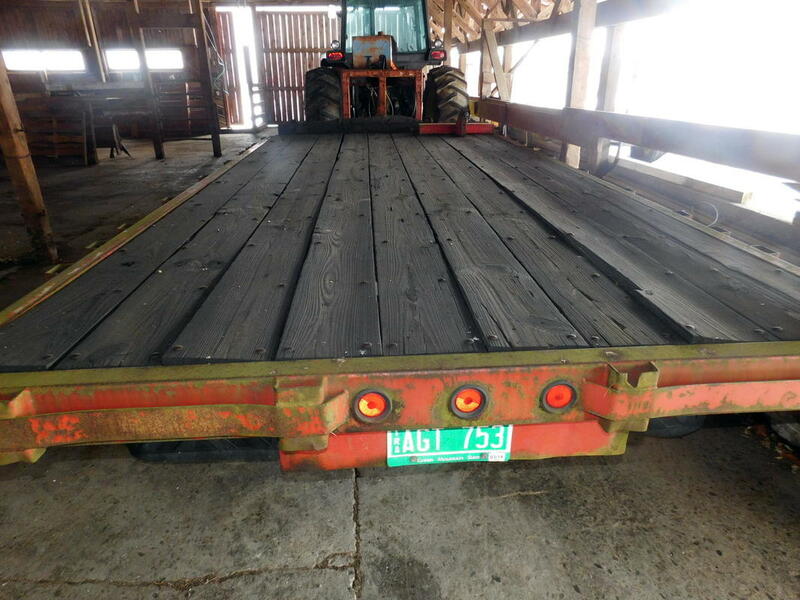 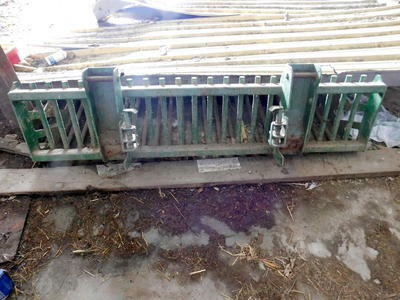 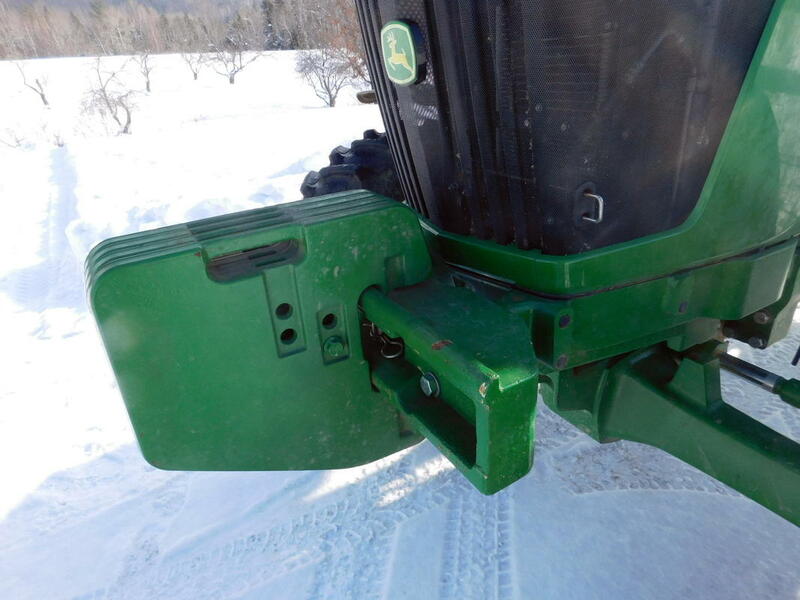 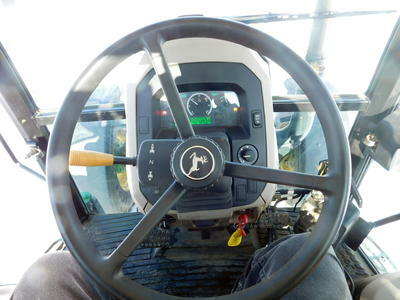 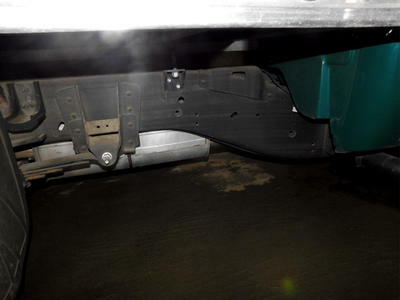 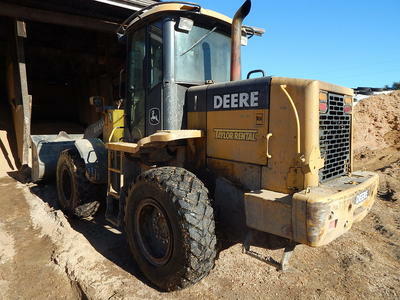 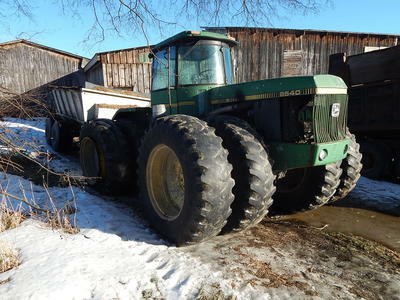 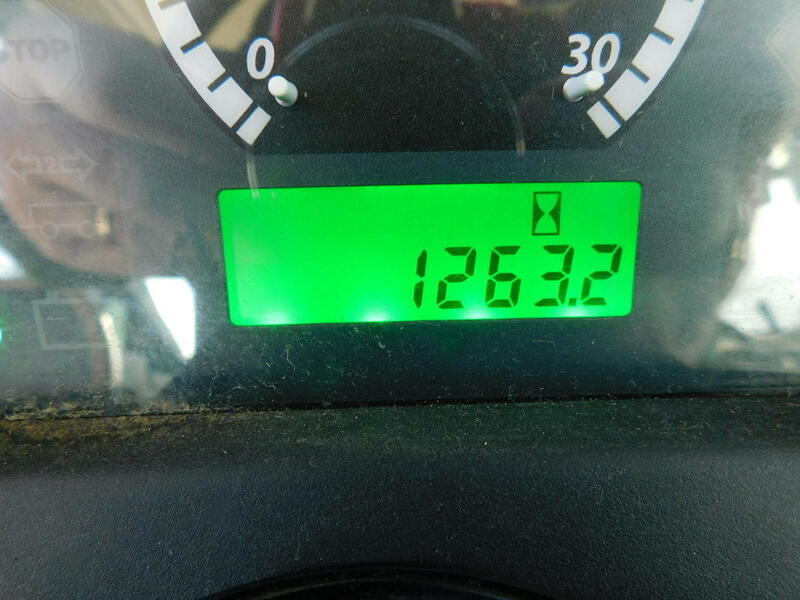 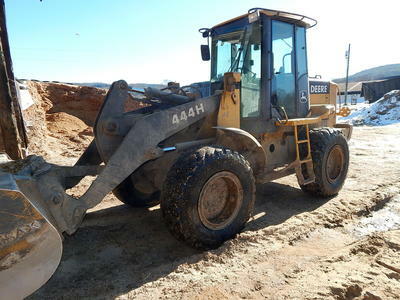 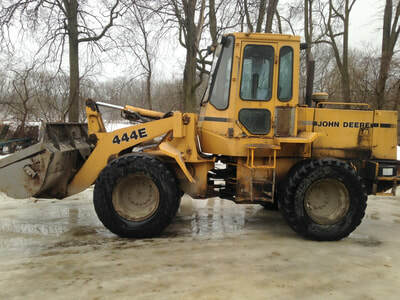 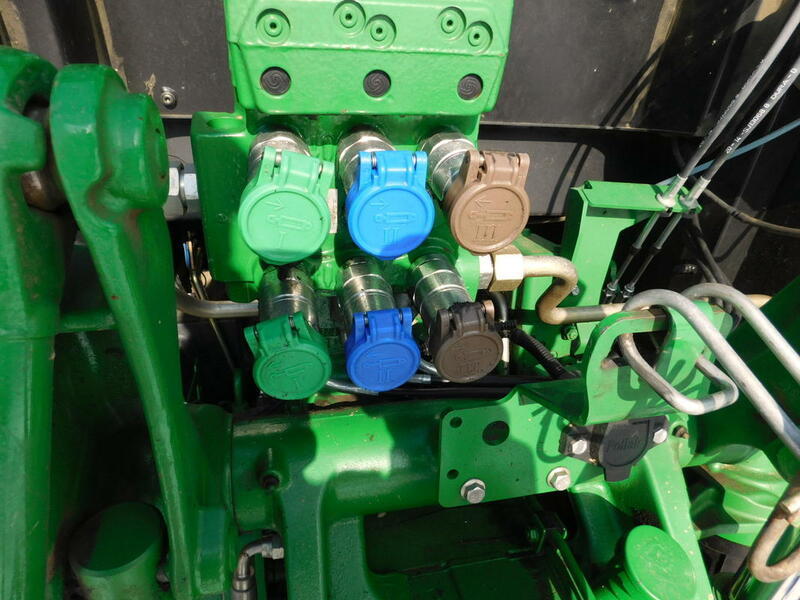 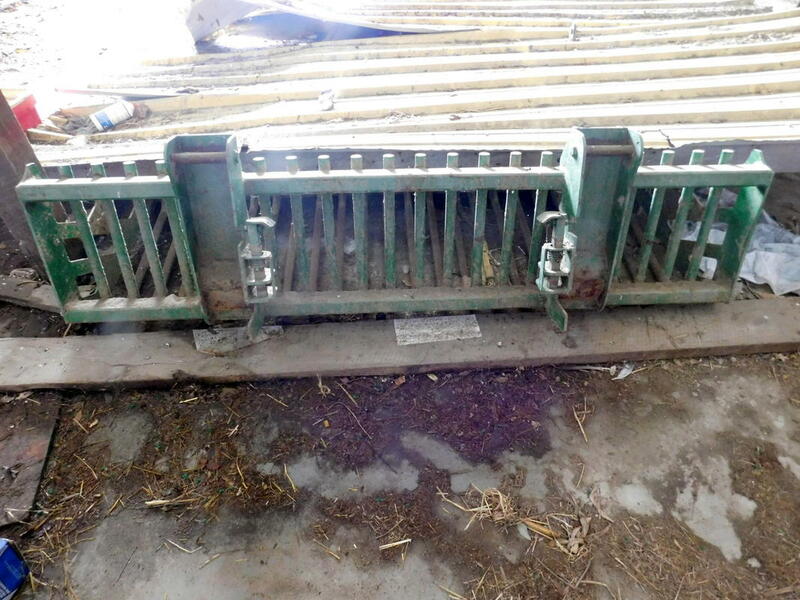 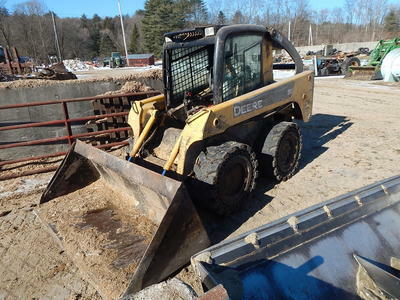 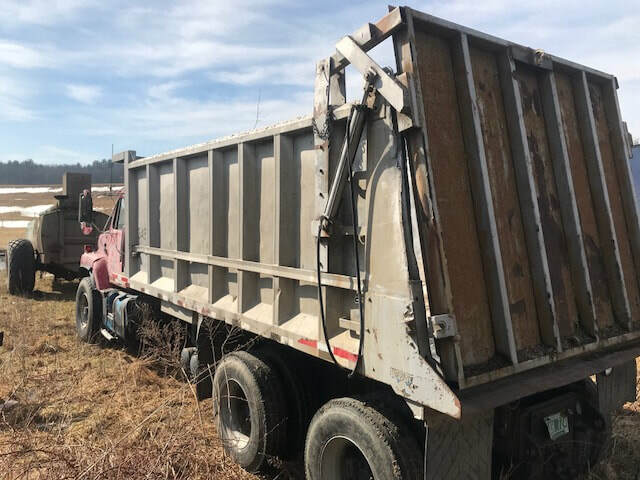 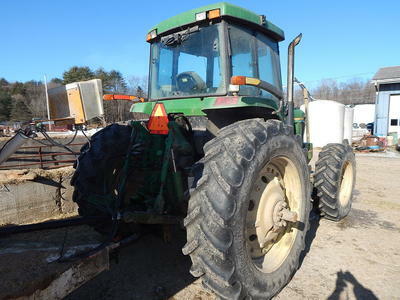 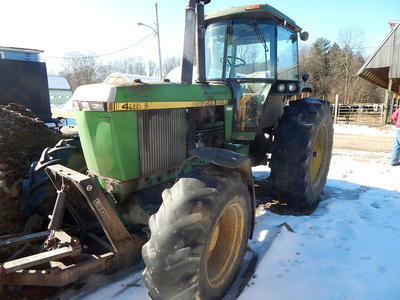 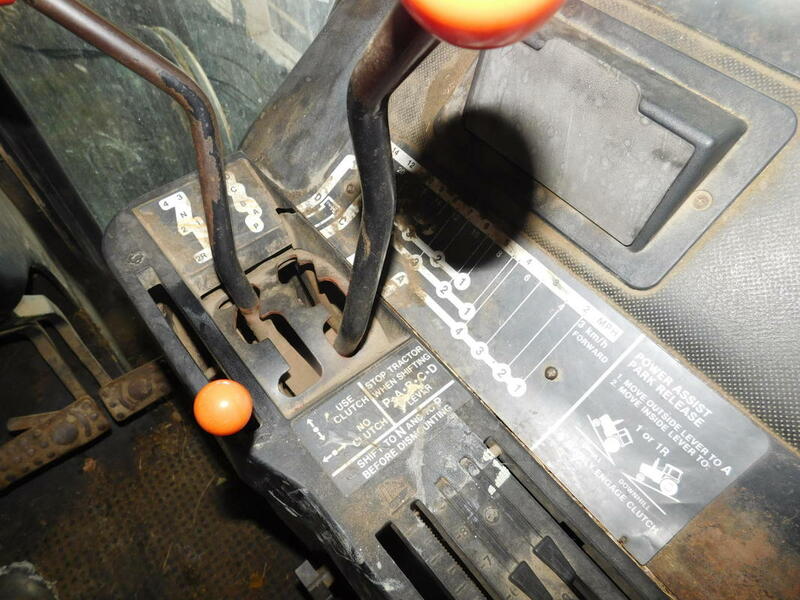 JD 444H loader, JD 444E loader, JD 444E loader for parts, JD 6150M 4x4-cab-H360 loader-3800 hrs, (2) JD 7810 4x4 tractors with cabs, JD 6715 2wd with cab, JD 6603 2wd with cab, JD 6110 4x4 with 640 loader-canopy, JD 6400 4x4 with cab & loader-less than 2000 hrs on motor, JD 4255 4x4 with cab-duals-power shift-Leon push blade, JD 8640 4x4 with cab-duals front & rear, Kubota M105S 2wd with cab, Ford 5600 diesel-1000 hrs on new motor, 2017 Kubota SSV75 2 speed skid steer with cab-800 hrs, JD 317 skid steer, Rogator 264 4x4 sprayer, (2) Mack 1987 R688ST dump trucks with 20' alum bodies, Mack R686ST with 20' steel dump & power gate, 1987 Mack DM 10 wheeler with 4000 gal Houle tank, Mack R Mod dump, Mack 10 wheeler cabover no body, Mack parts truck, 2007 GMC 1 ton mechanics truck-4x4, 1995 GMC Top Kick milk truck, Ford 7000 form truck with cement forms, 2008 CM alum 16' cattle trailer, Hudson 8000# tag along trailer, Kuhn Knight RC260 Helix mixer with scales, Jay Lor 4425 mixer, JD 946 MoCo Hydro Swing disc mower-1 year old, NH H7450 Hydro Swing disc, JD trailer for Hydro Swing mowers, Kuhn GF5001THA Digidrive tedder, Kuhn GA7932 Master Drive double rake, Kuhn GA7822 Master Drive double rake, Houle 32' pump, (2) Kuhn Knight 8132 side slinger spreaders, Hagedorn 275 hydro push box spreader, Knight 8032 Industrial side slinger, Loewen 3000 gal vac self loading manure tank, Kverneland 5 bottom adjust-a-width plows, Ford 5 bottom spring reset plows, Brady 820 3pth chisel plows, JD 235 transport harrows with wings, Ford 241 transport harrows with sod busters, JD 950 cultipacker, Brillion 22' spring tooth harrows, Kinze 3600 12 row corn planter with transport, Kinze 3000 6 row planter, (2) Brillion 12' seeders with hyd lift, (3) Mensch sawdust shooters-1 3pth, HLA stone bucket, (3) large 3pth cement weights, 4 large poly tanks, Gates hyd hose machine with fittings, Weatherhead mobile hyd hose machine, engine hoist, trans jack, hoof trimming chute, plus many more items. 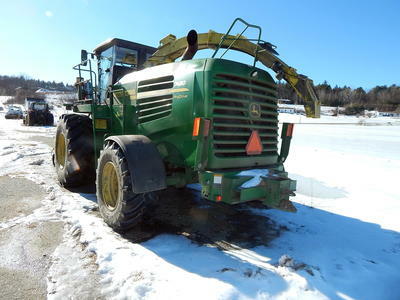 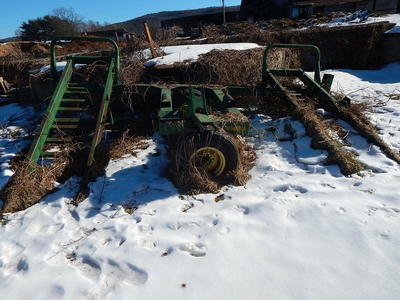 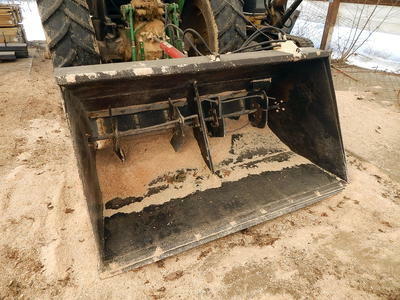 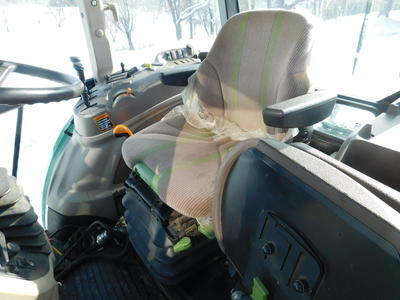 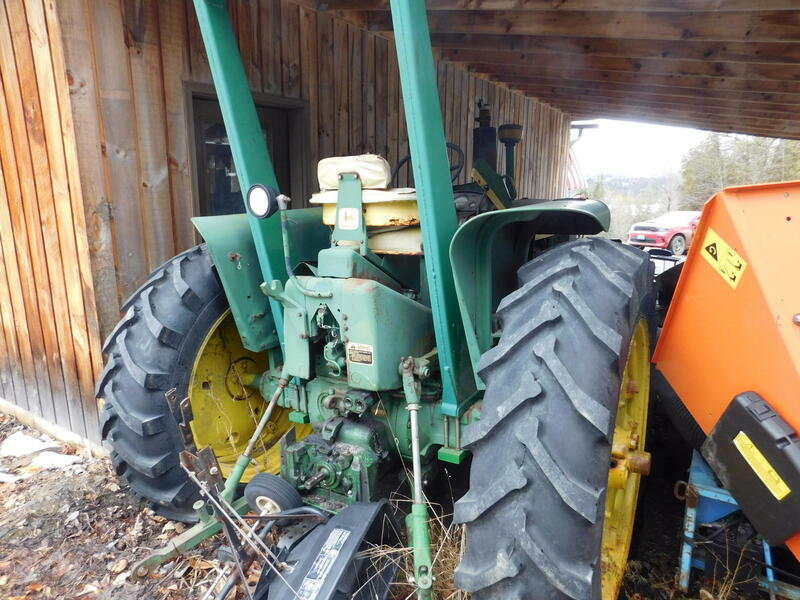 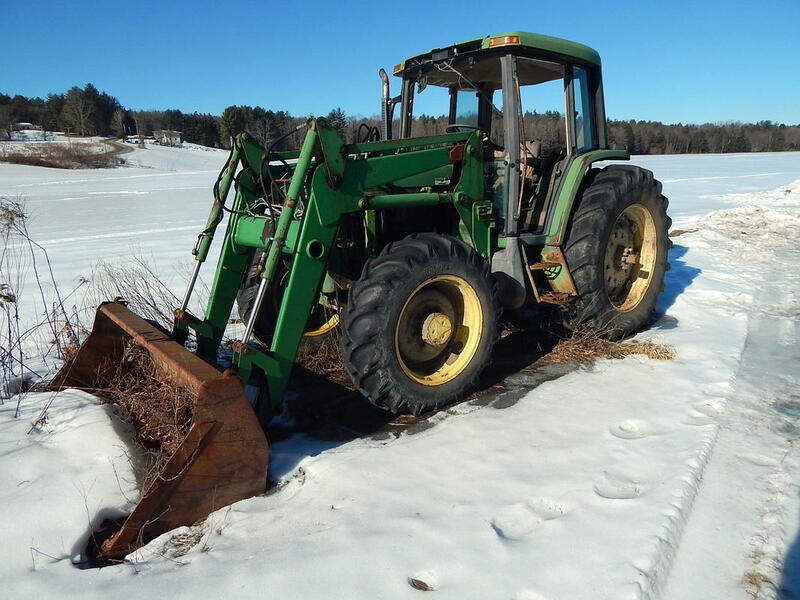 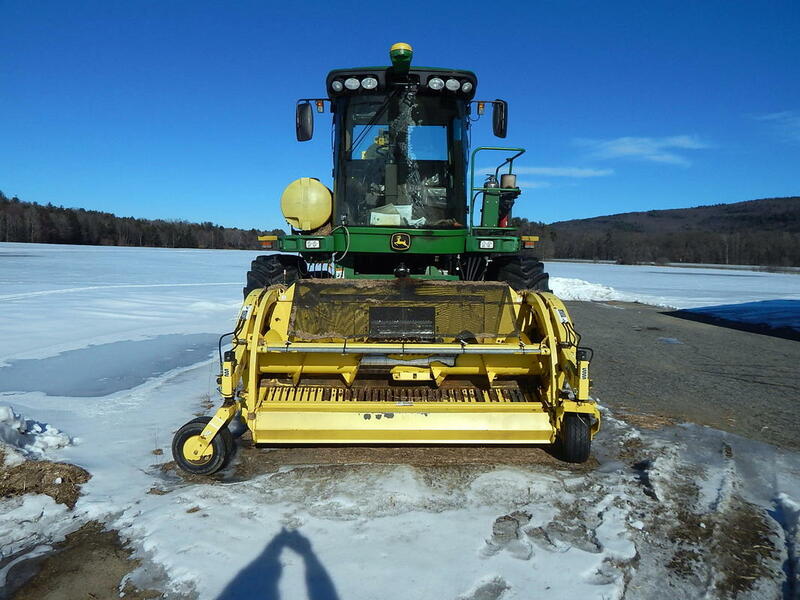 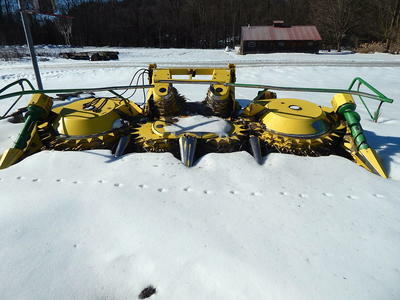 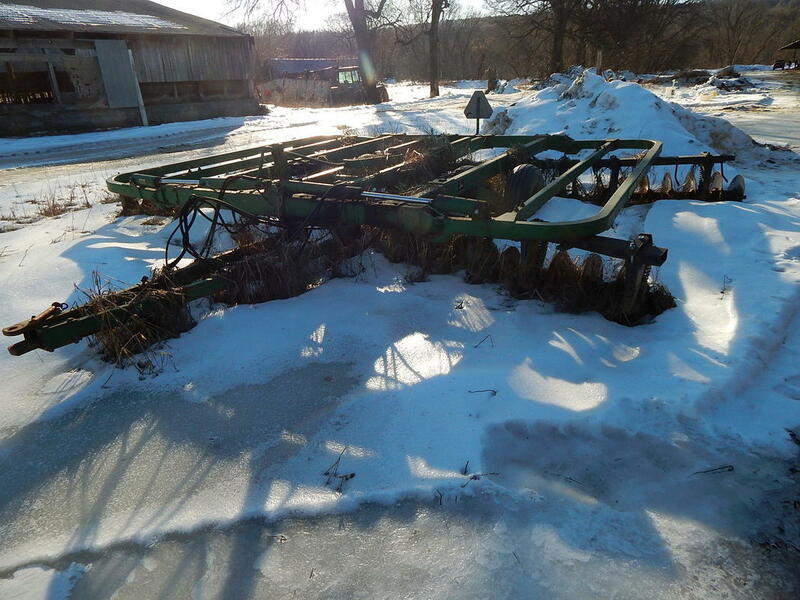 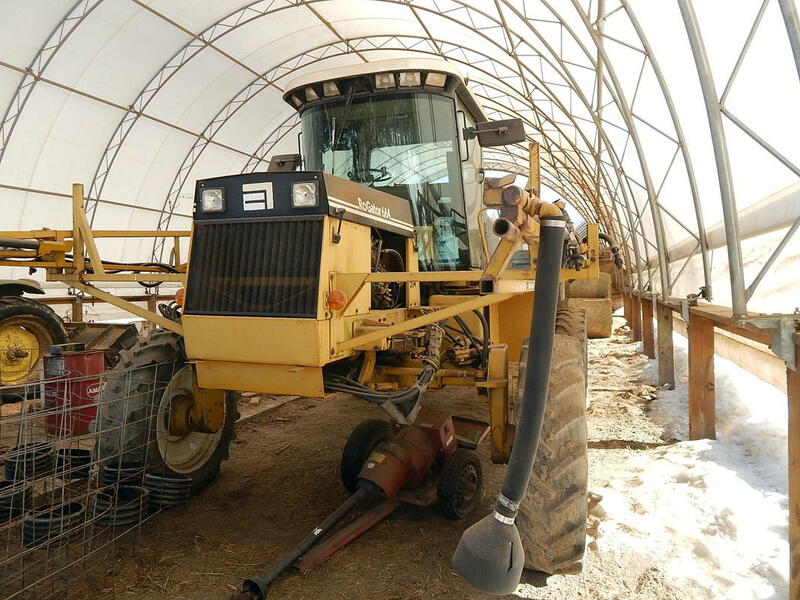 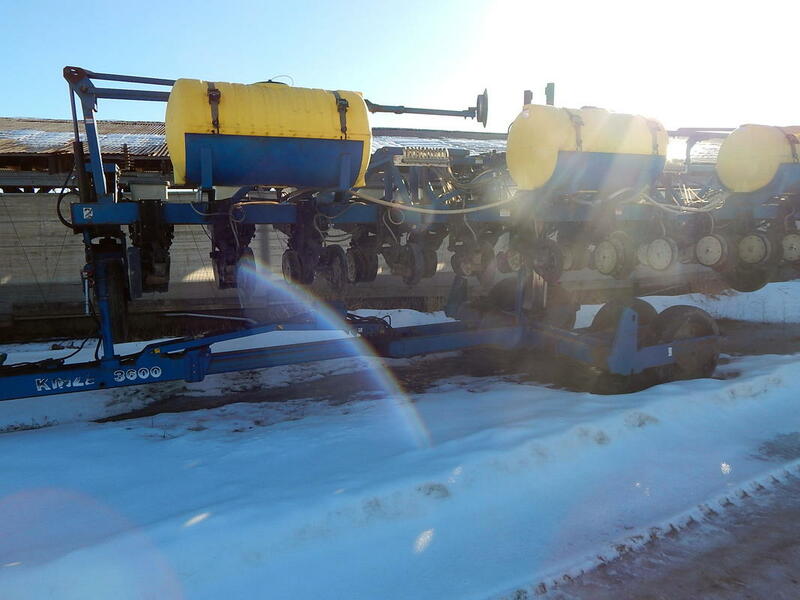 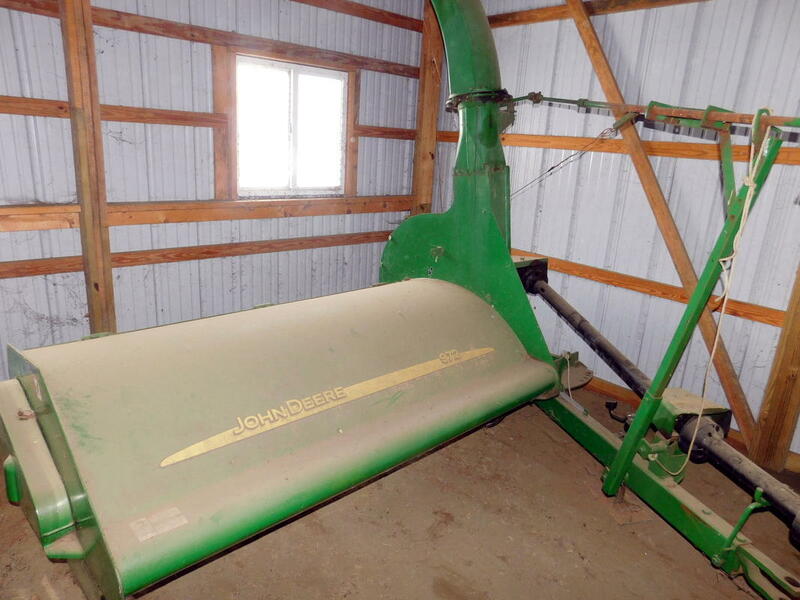 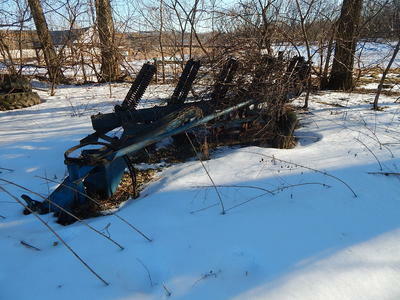 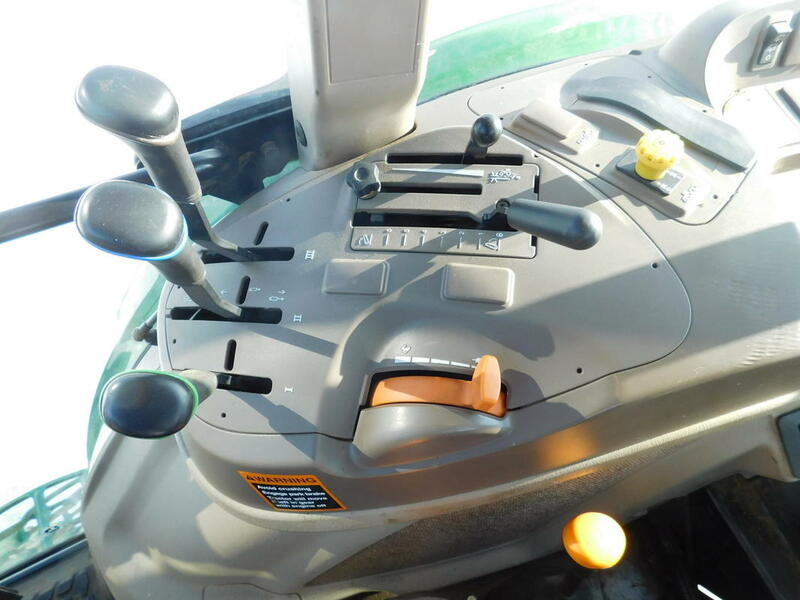 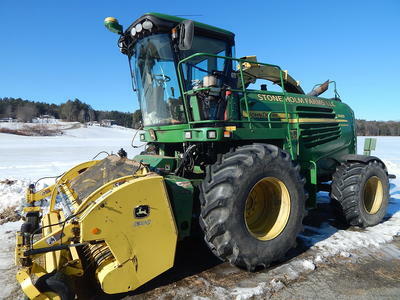 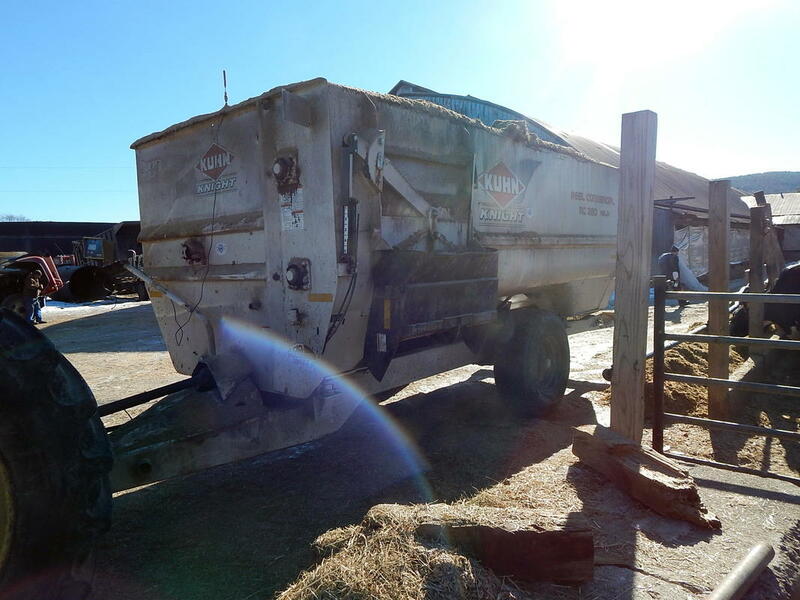 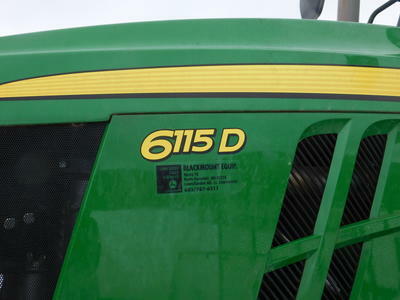 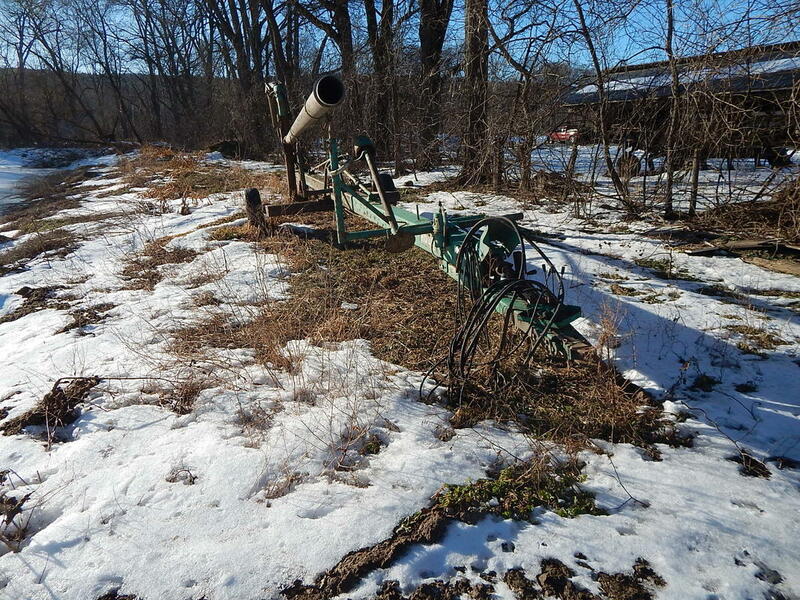 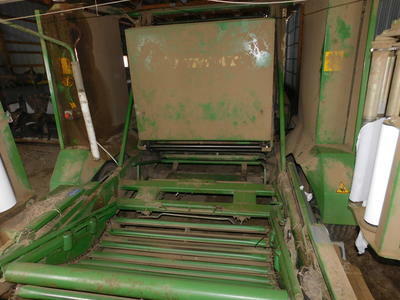 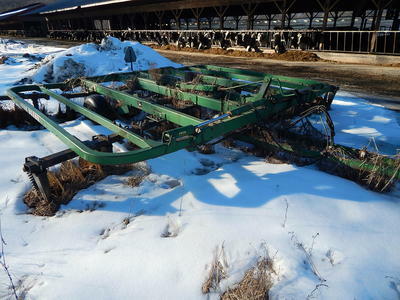 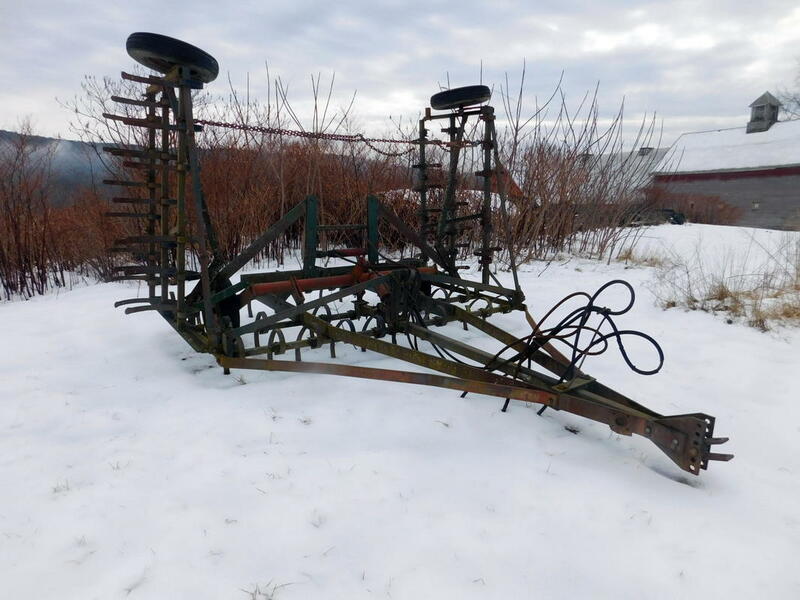 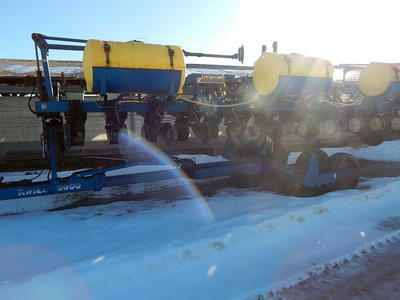 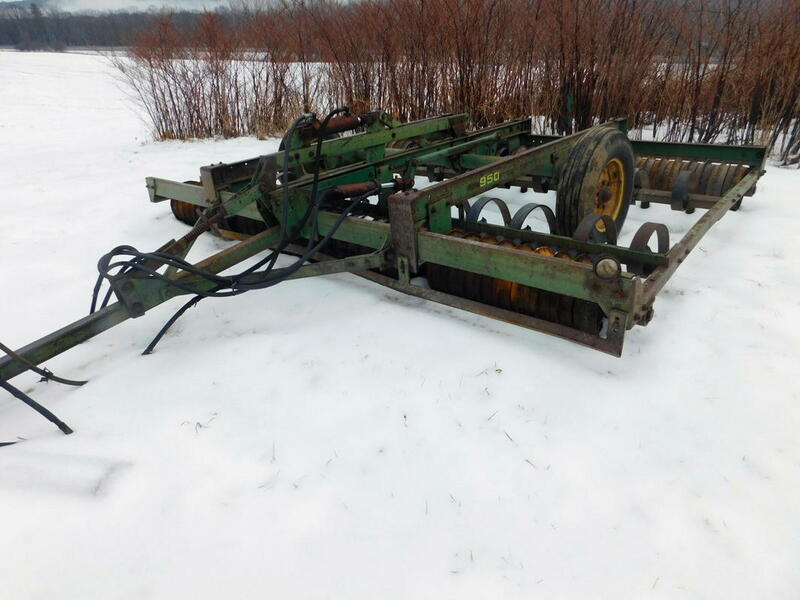 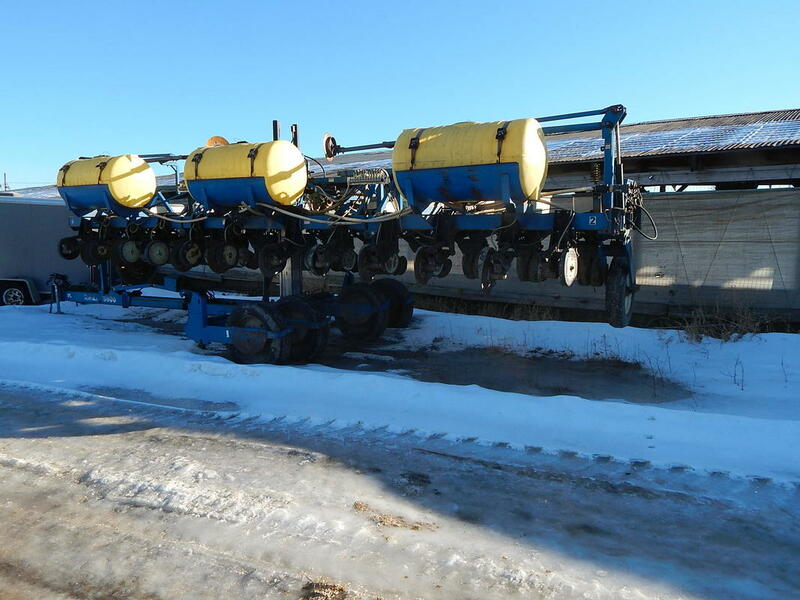 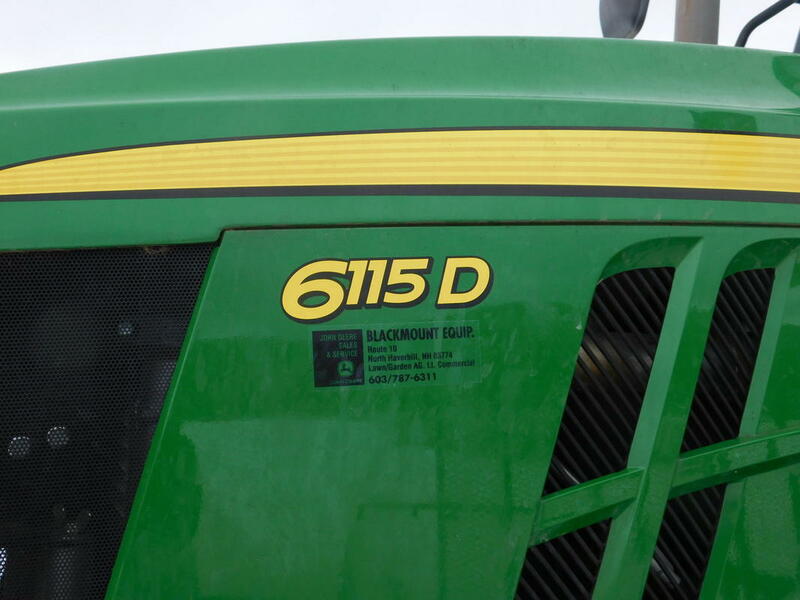 Special: John Deere 7450 Pro Drive self propelled chopper with 630C grasshead and 676 rotary corn head with large outside drums-1100 chopping hrs-excellent condition-used 3 seasons-Harvest Lab-sells with reserve. 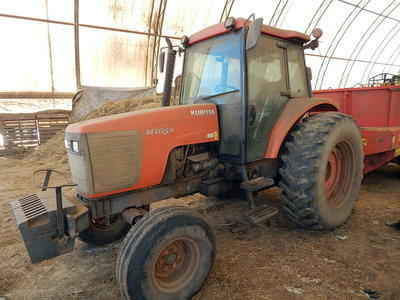 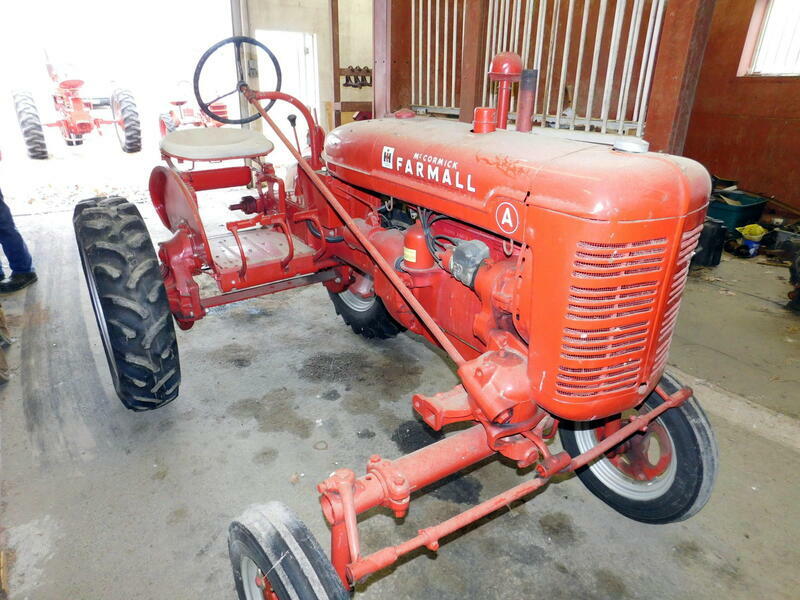 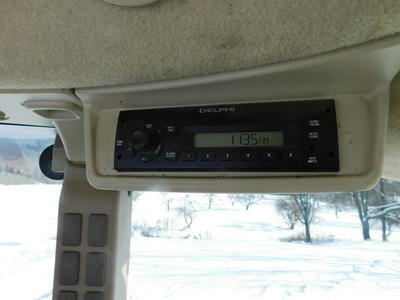 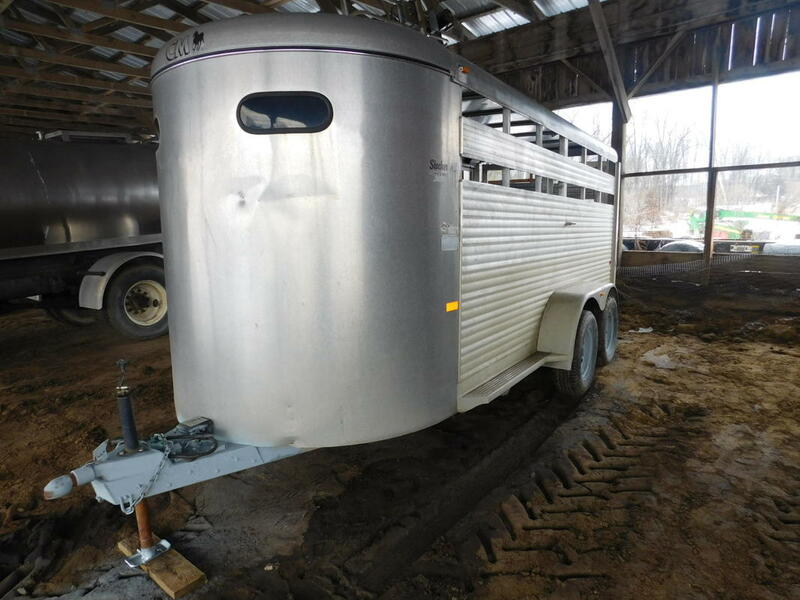 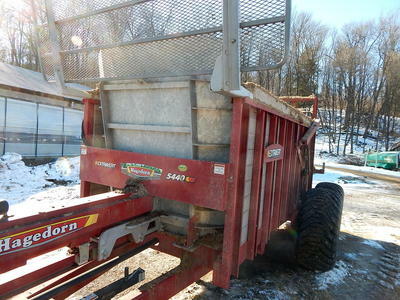 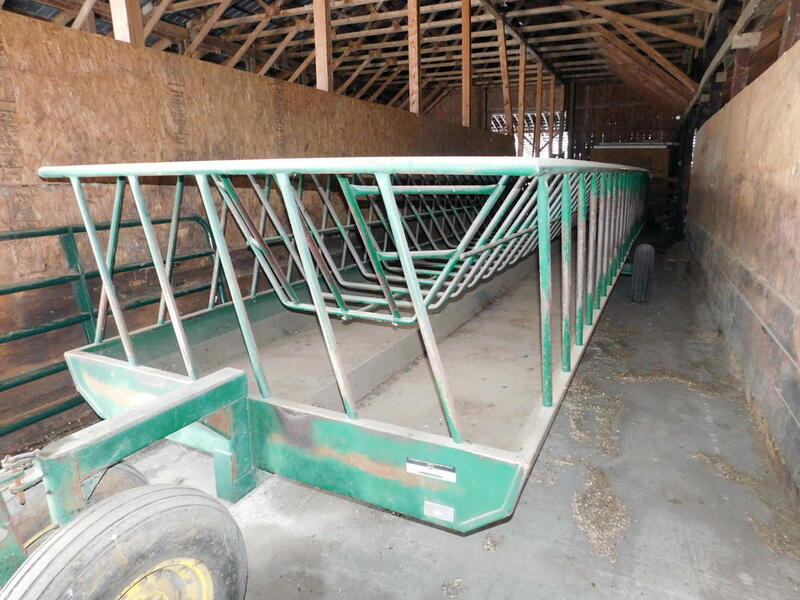 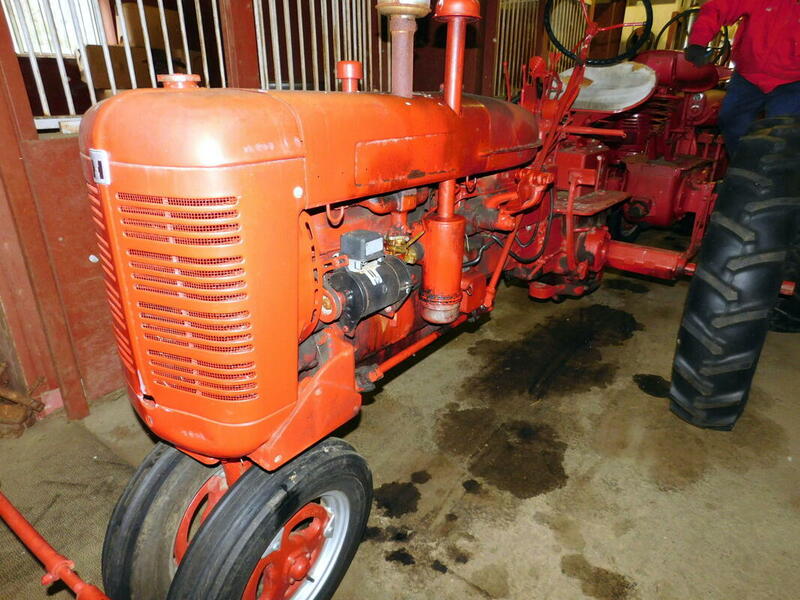 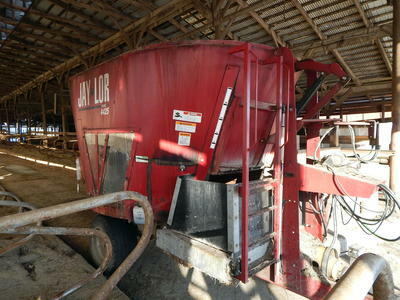 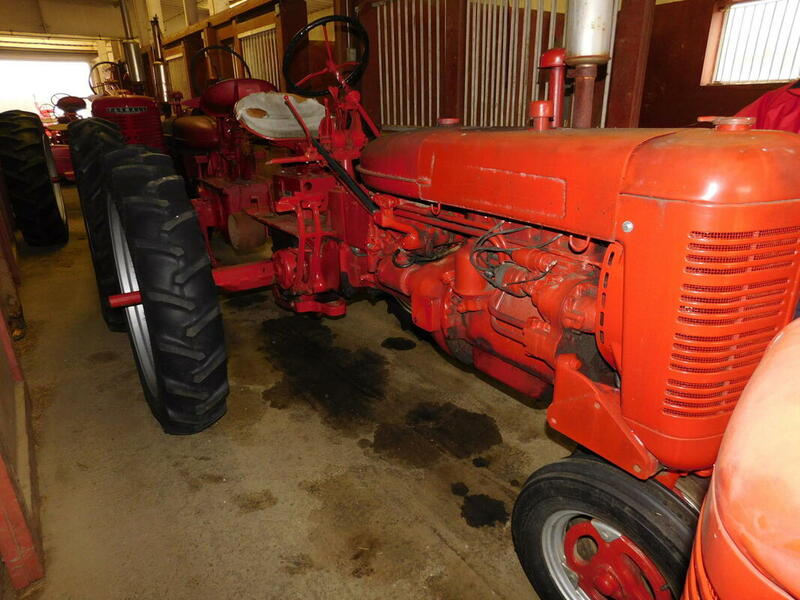 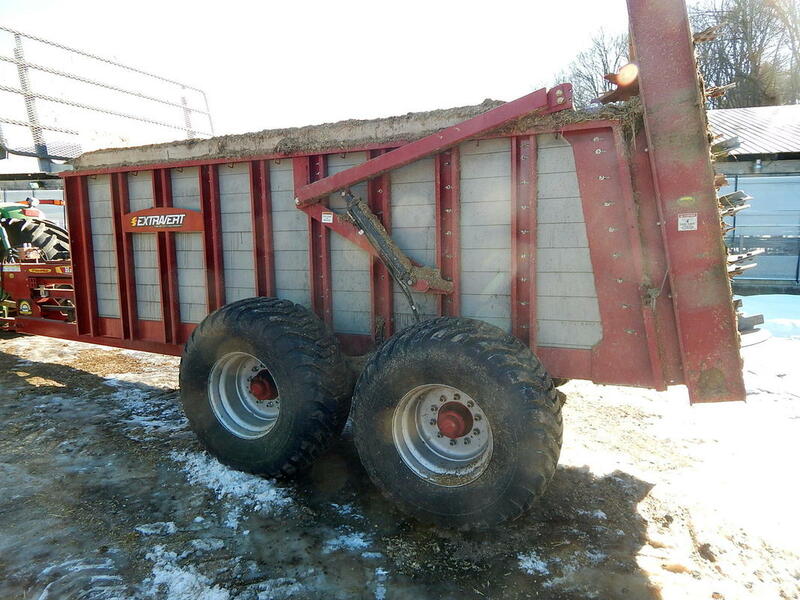 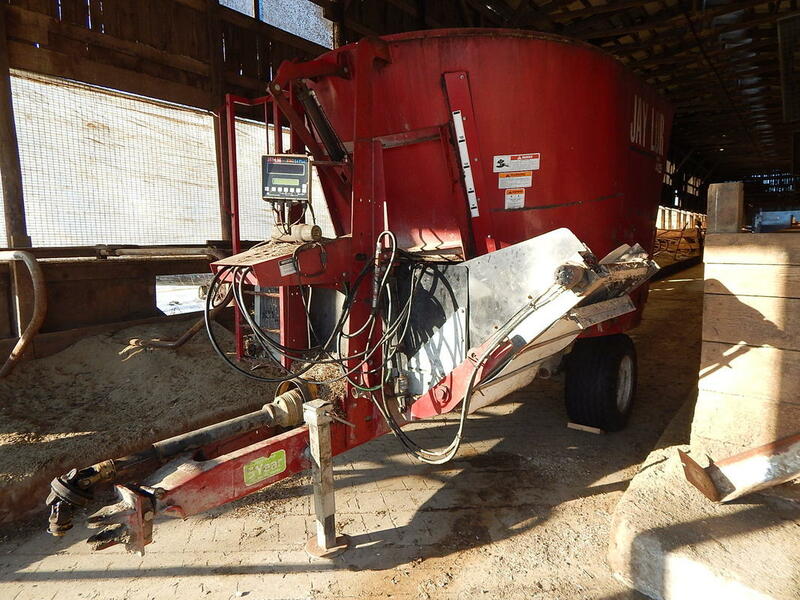 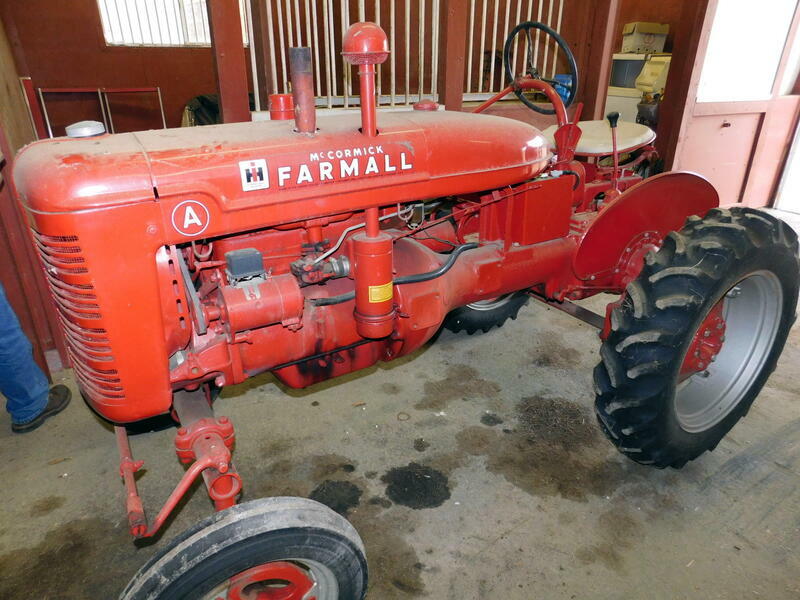 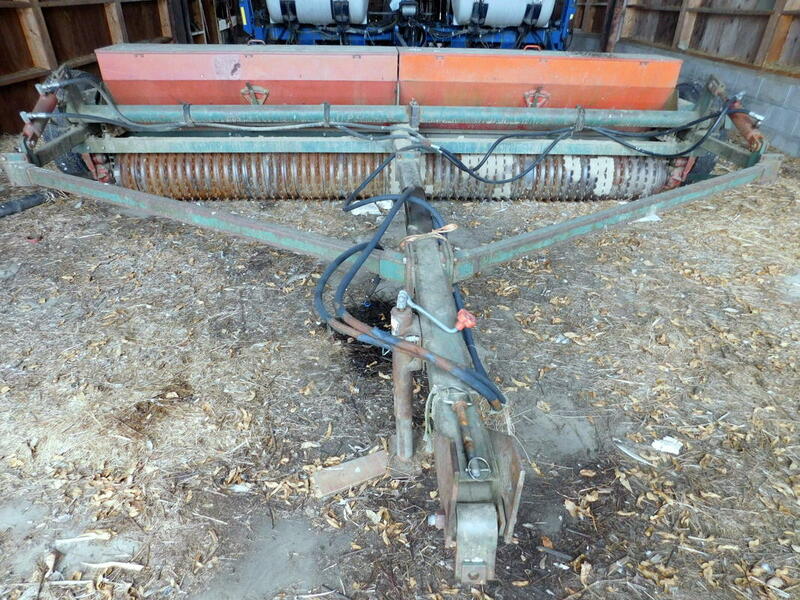 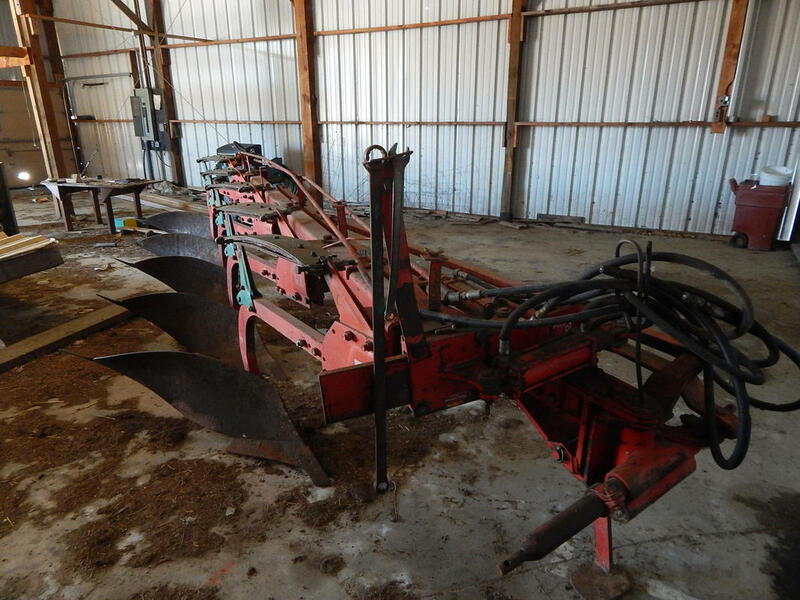 This promises to be a great sale with many choices to pick from, Equipment that is used in today's farming world. 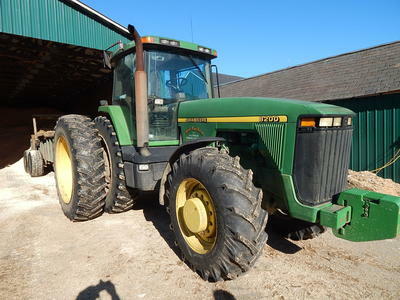 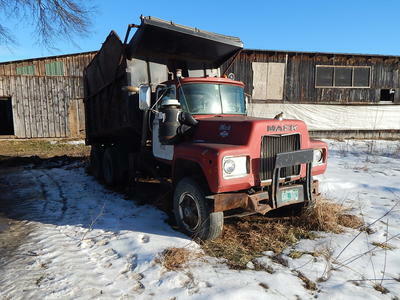 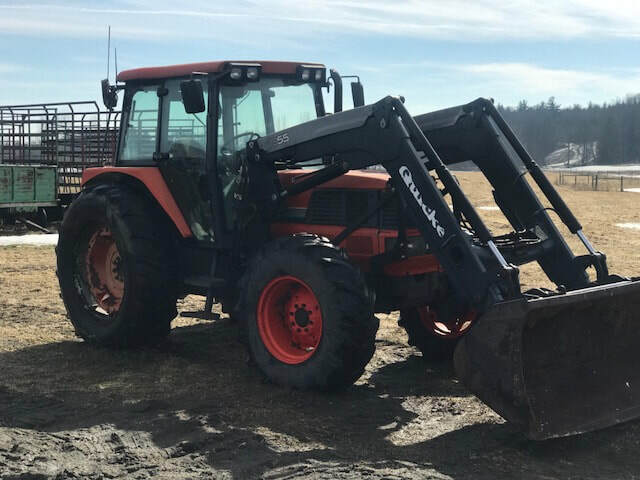 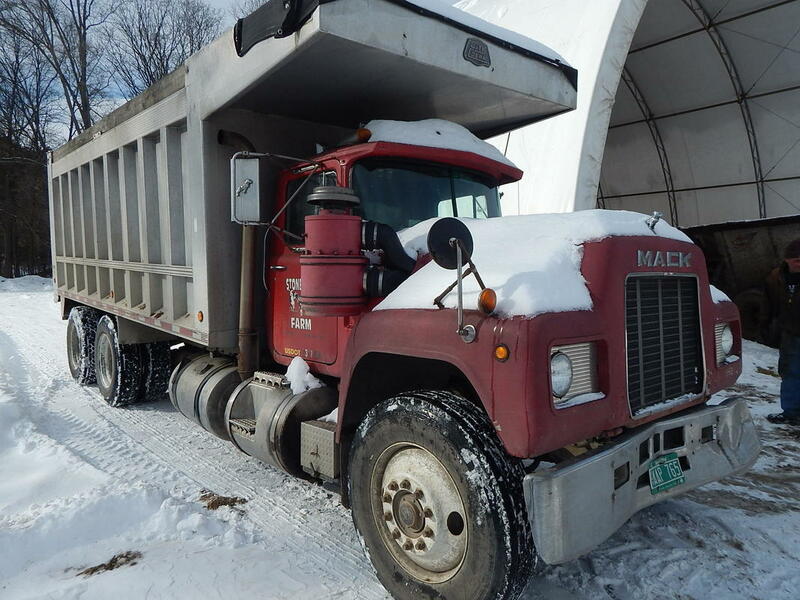 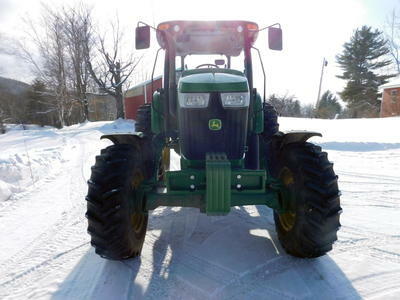 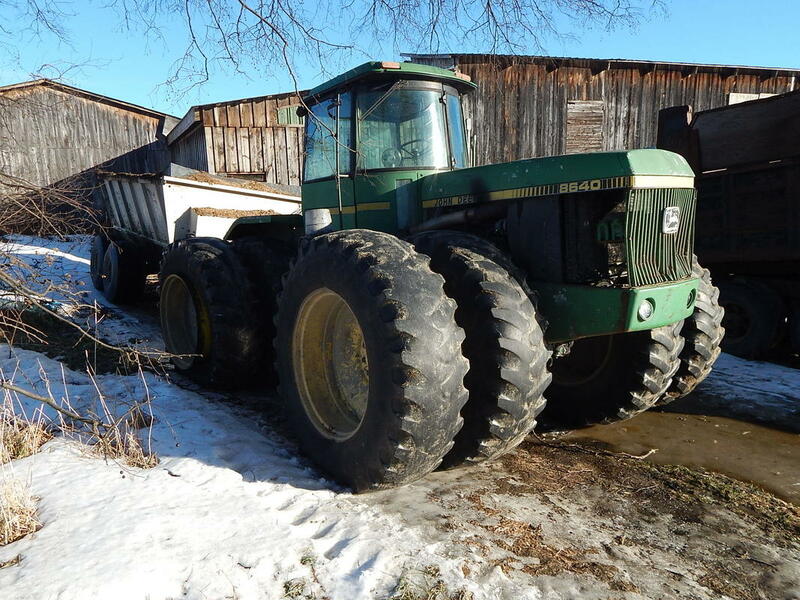 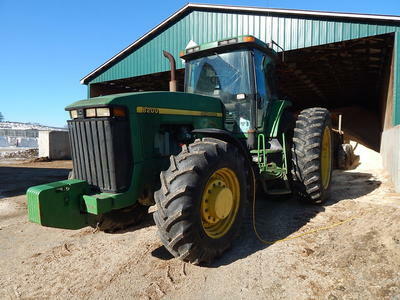 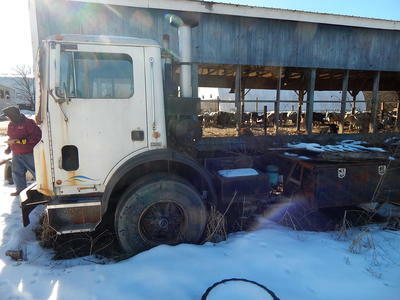 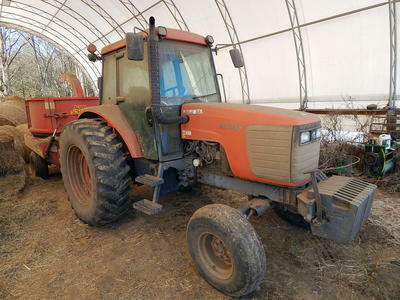 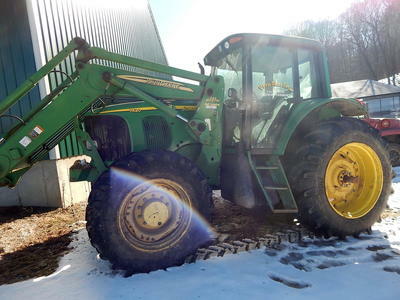 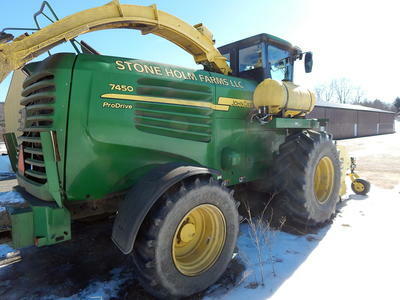 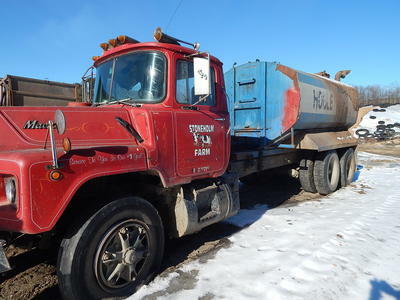 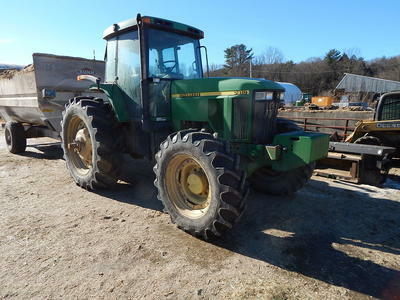 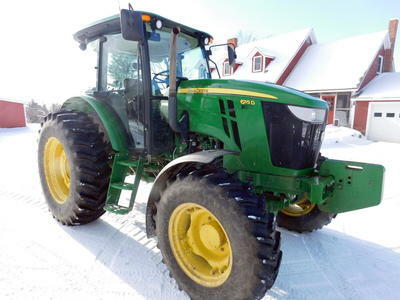 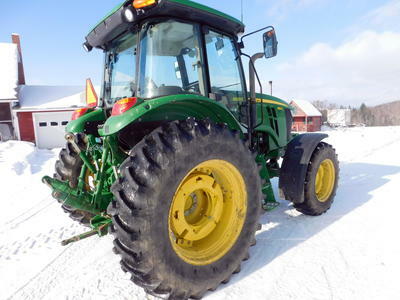 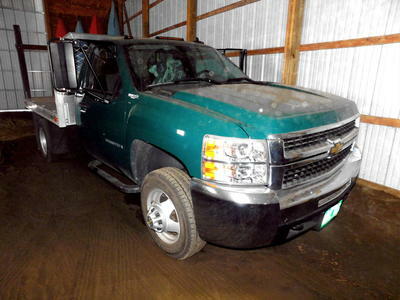 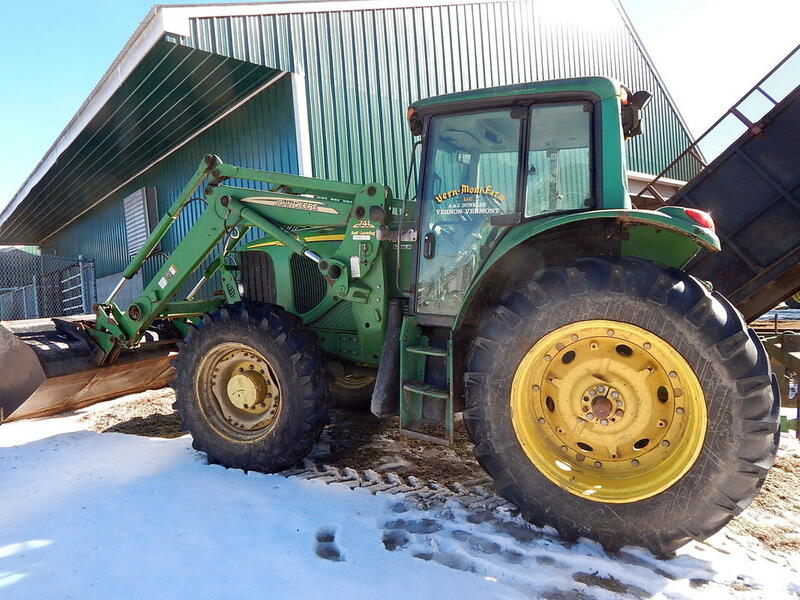 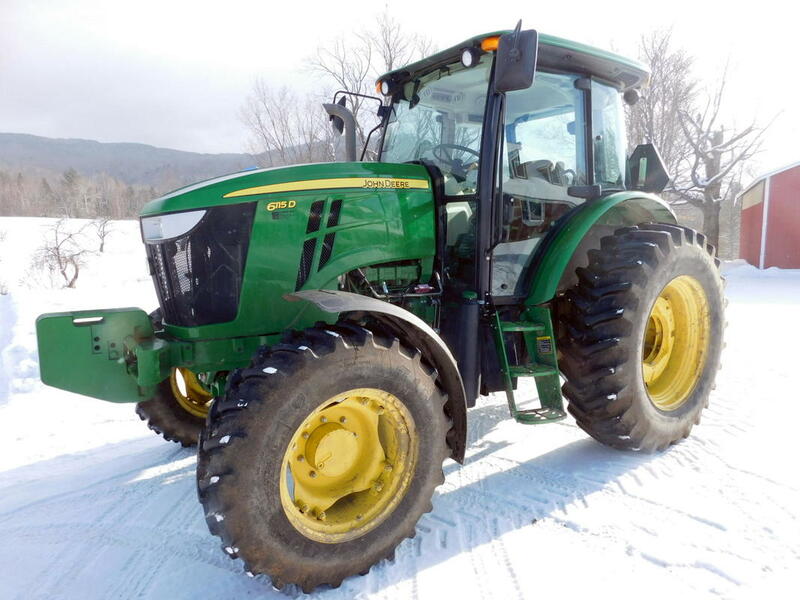 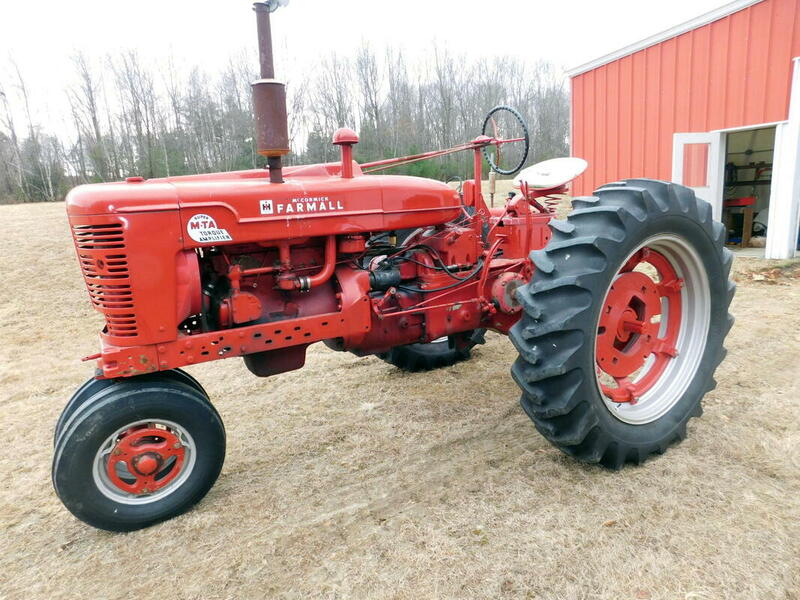 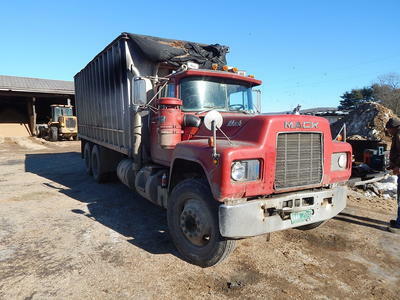 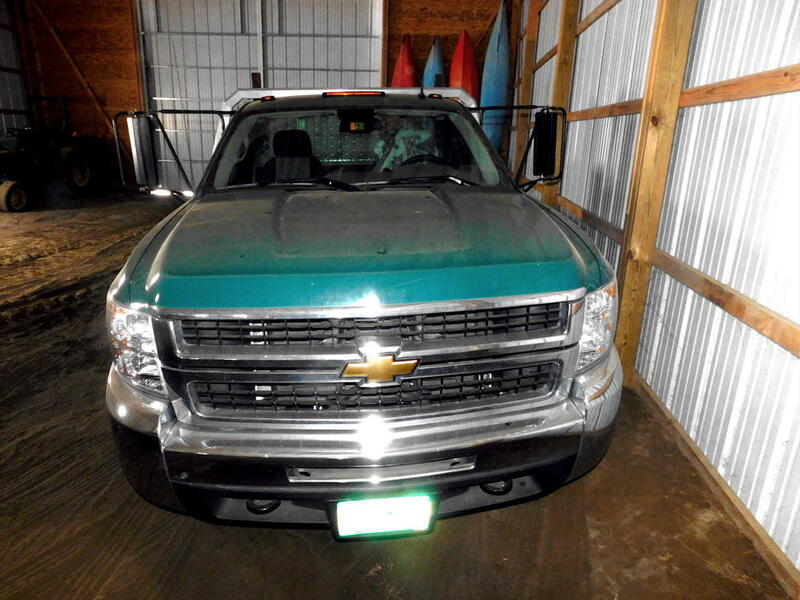 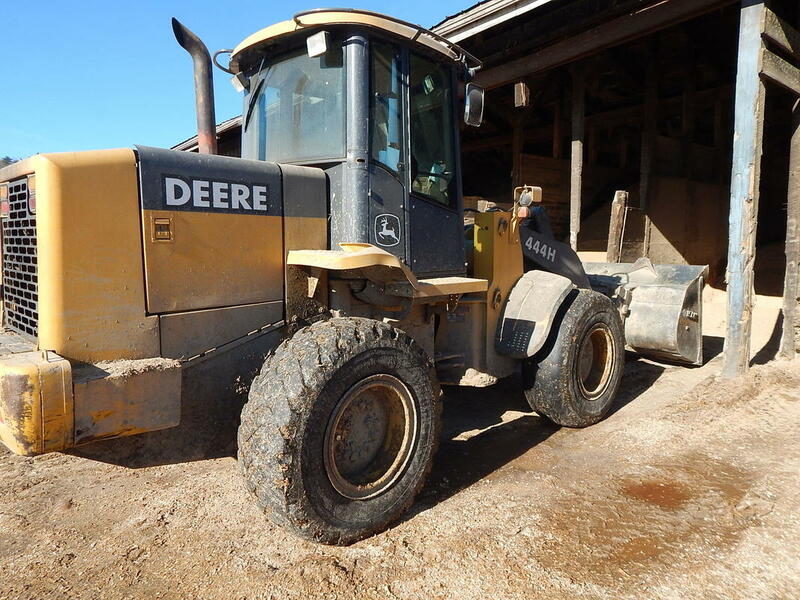 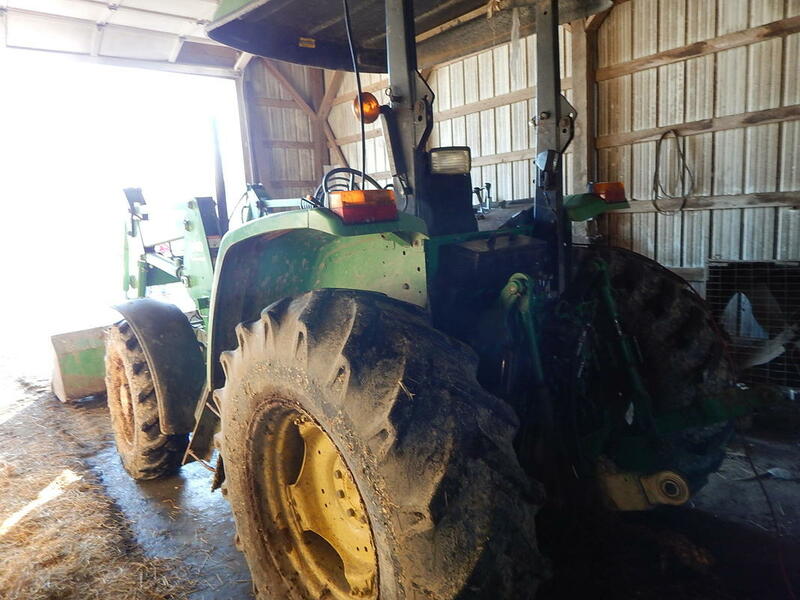 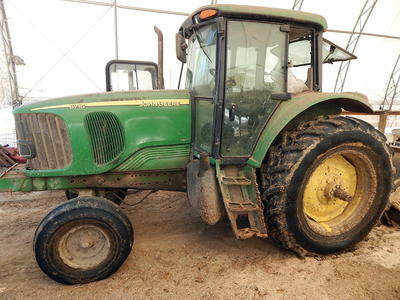 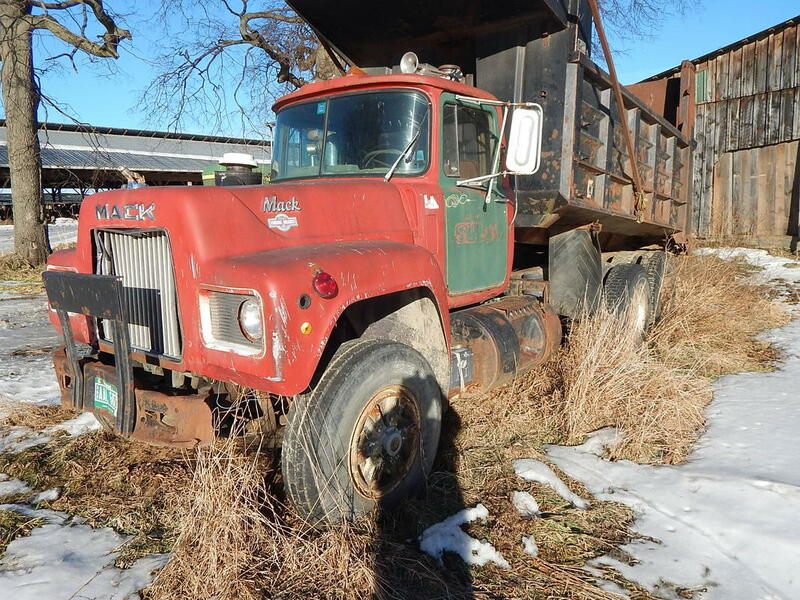 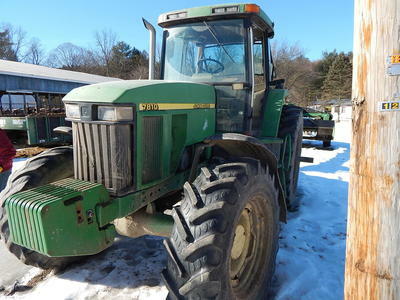 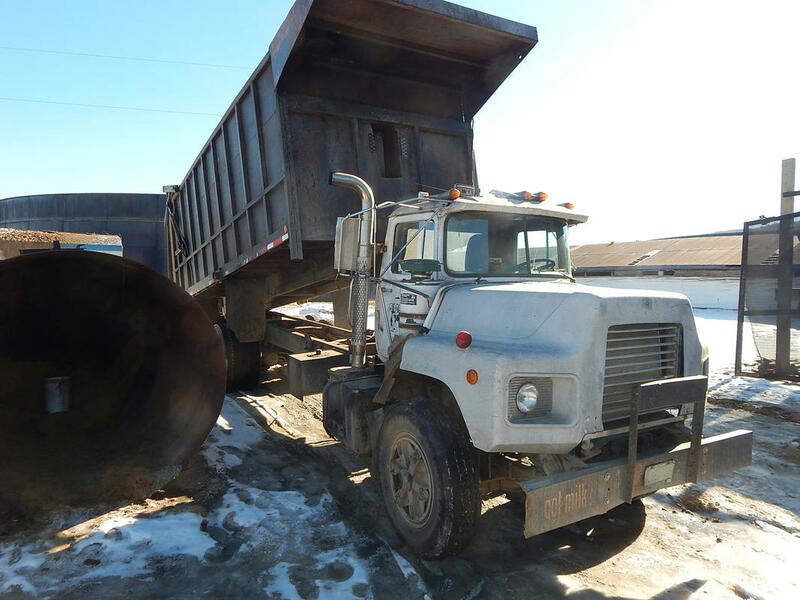 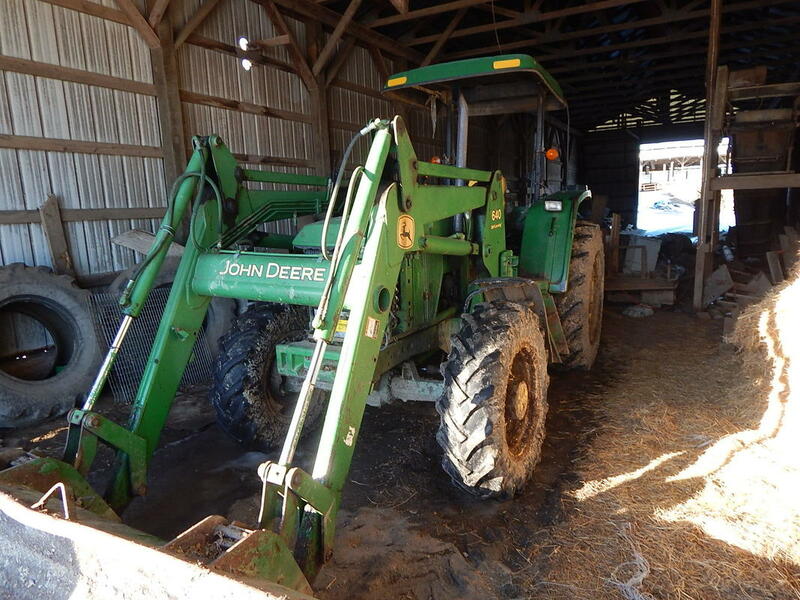 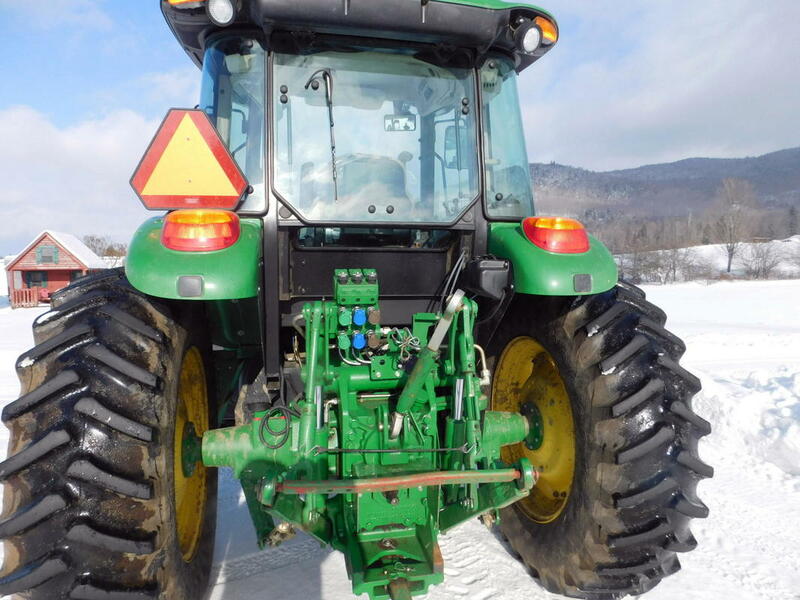 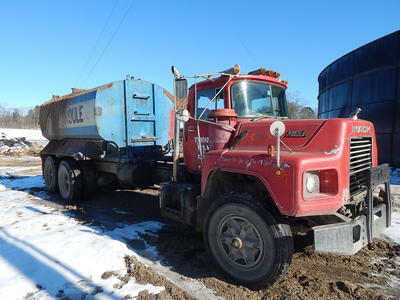 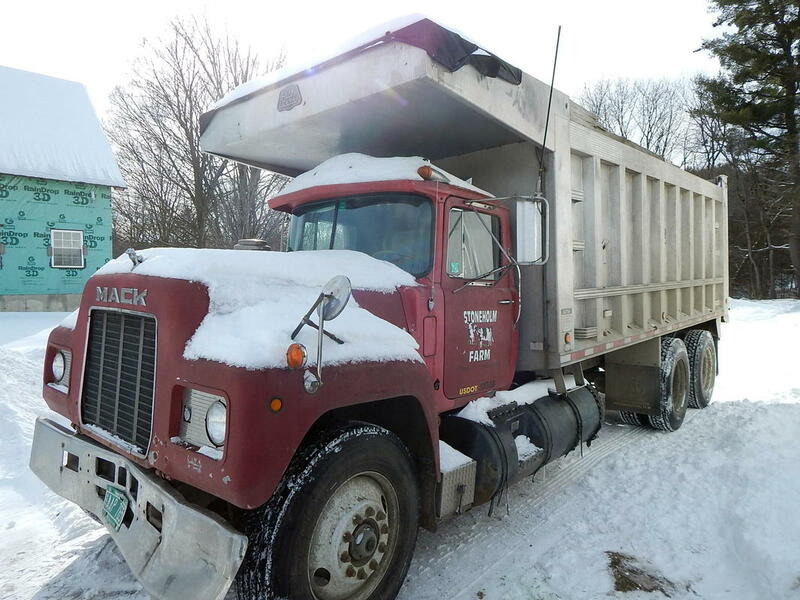 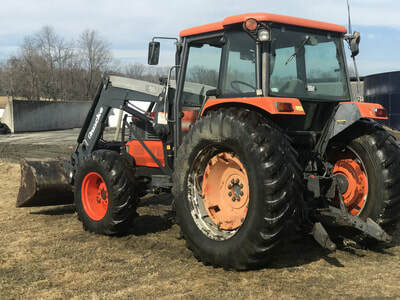 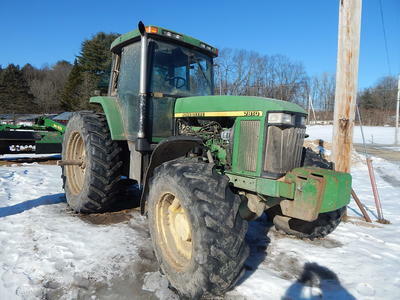 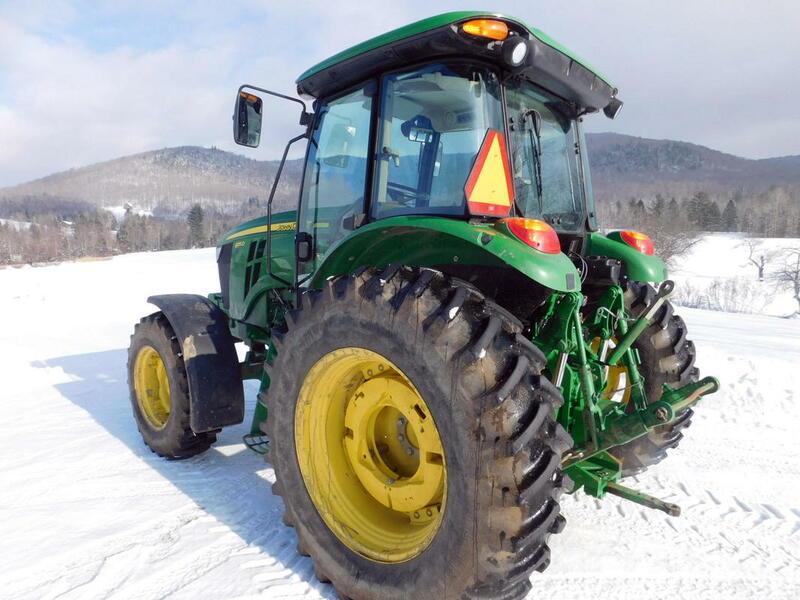 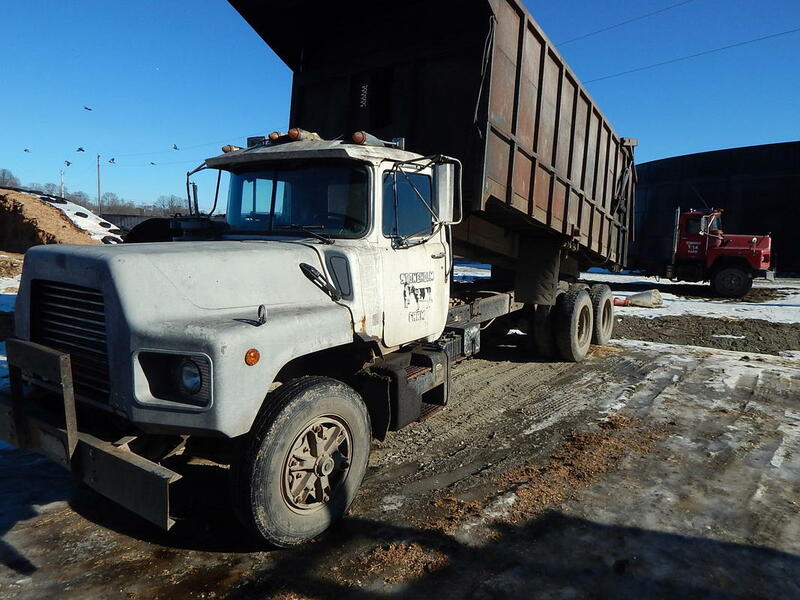 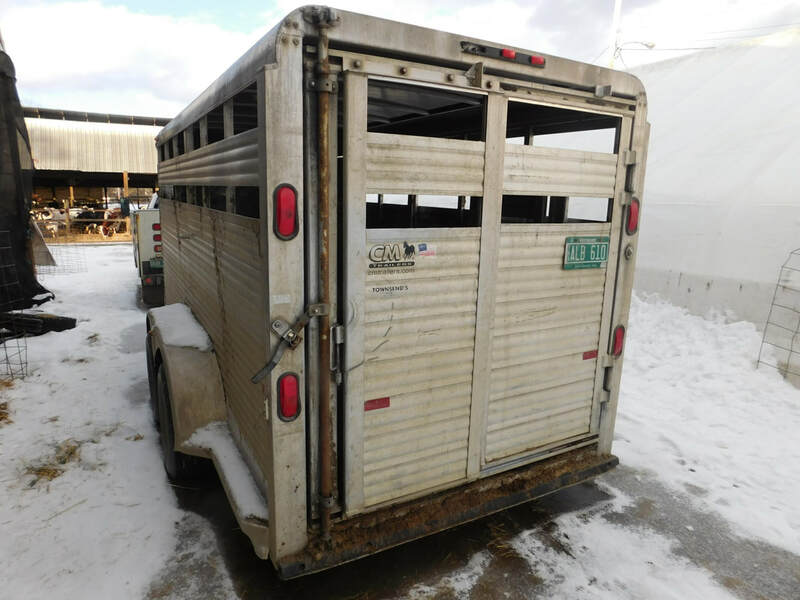 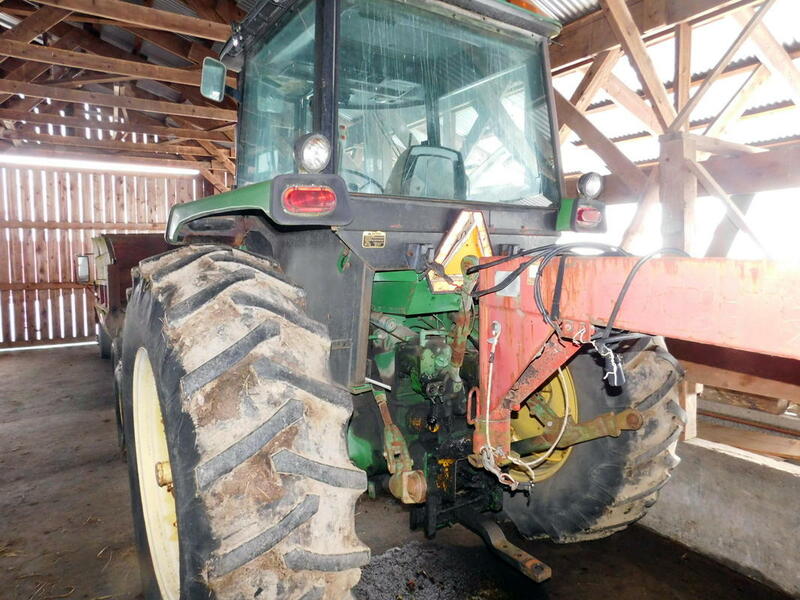 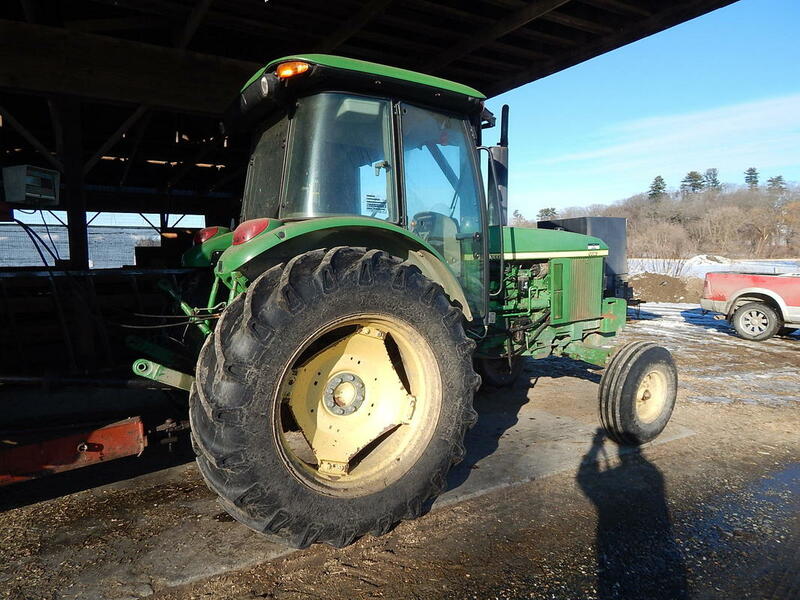 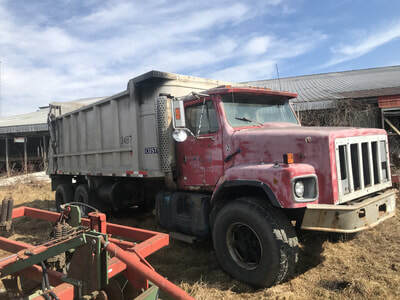 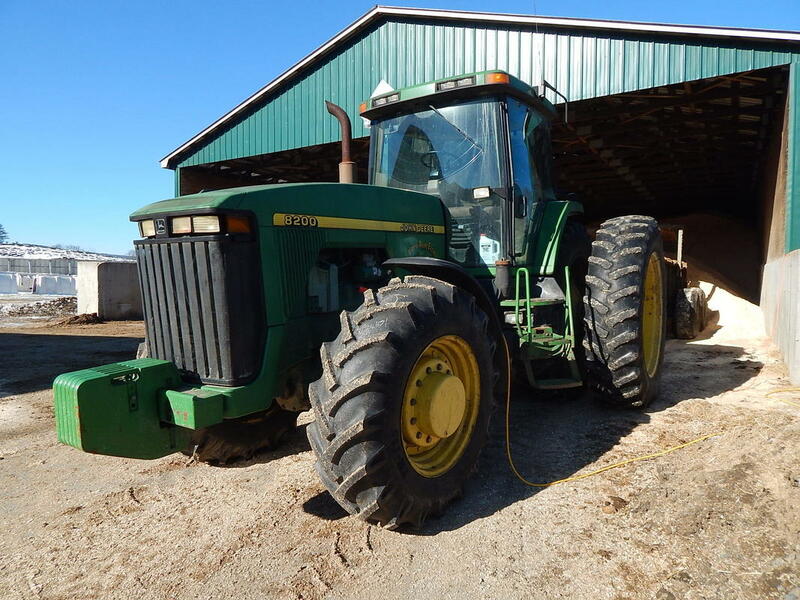 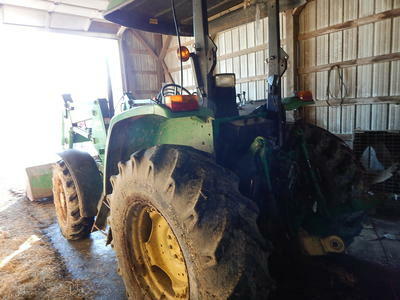 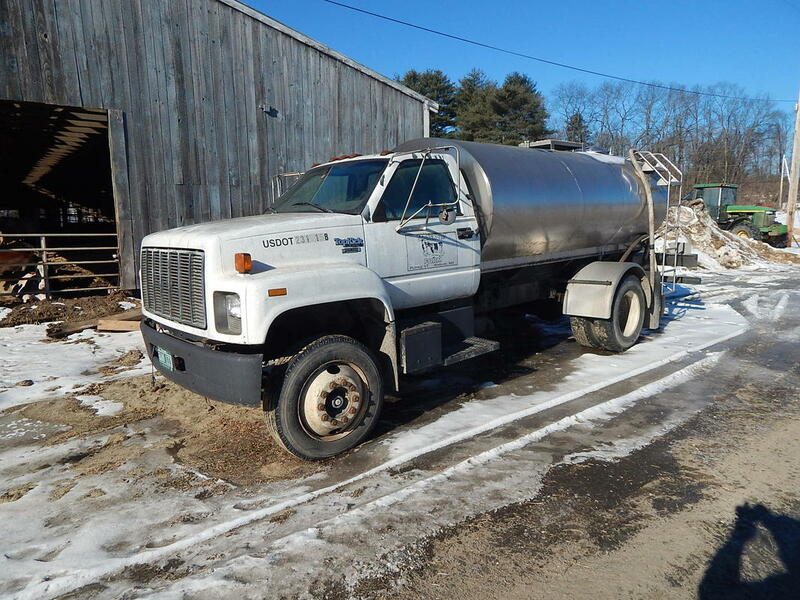 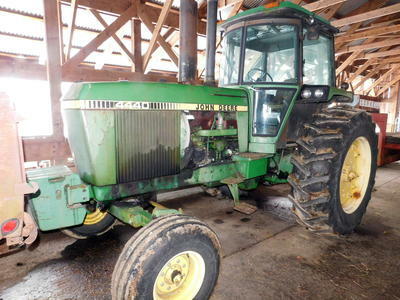 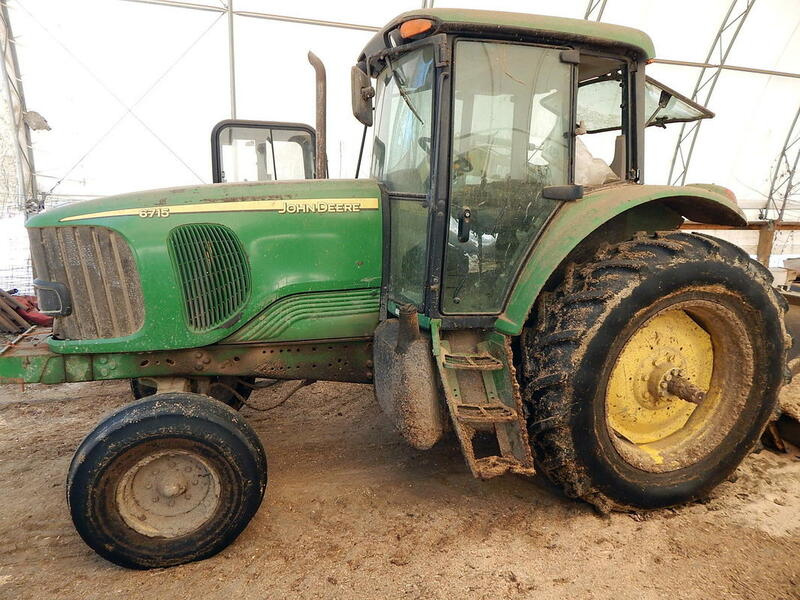 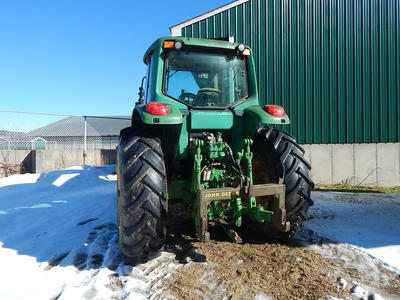 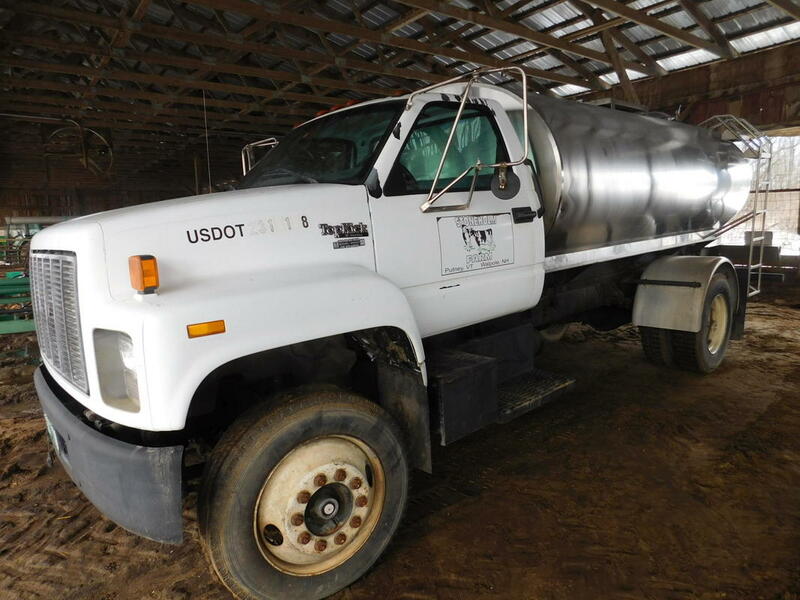 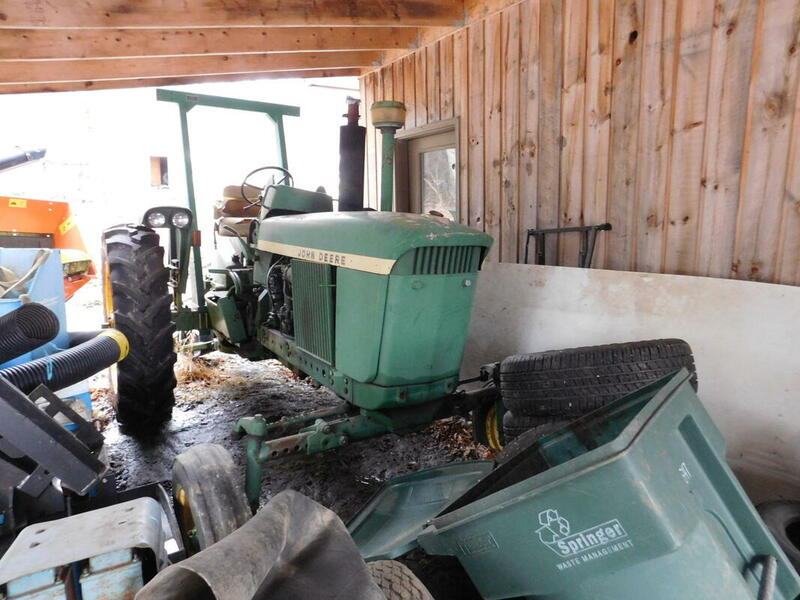 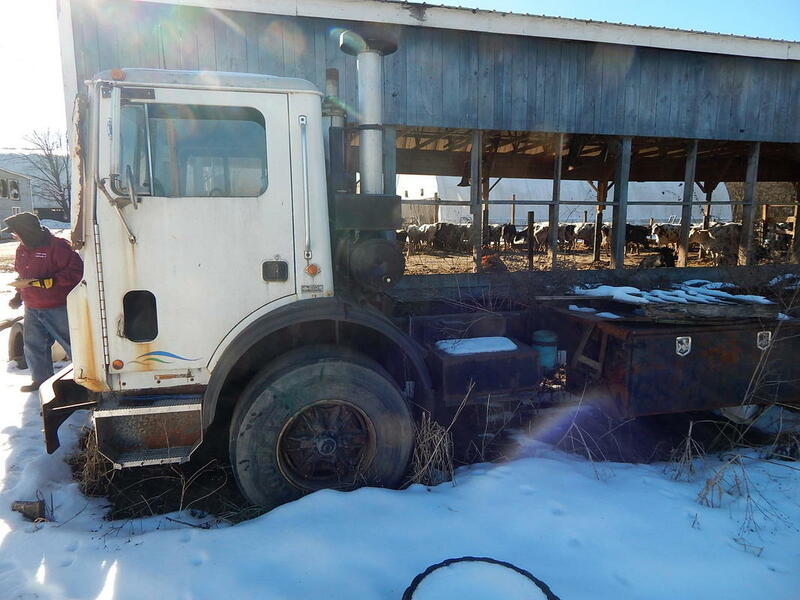 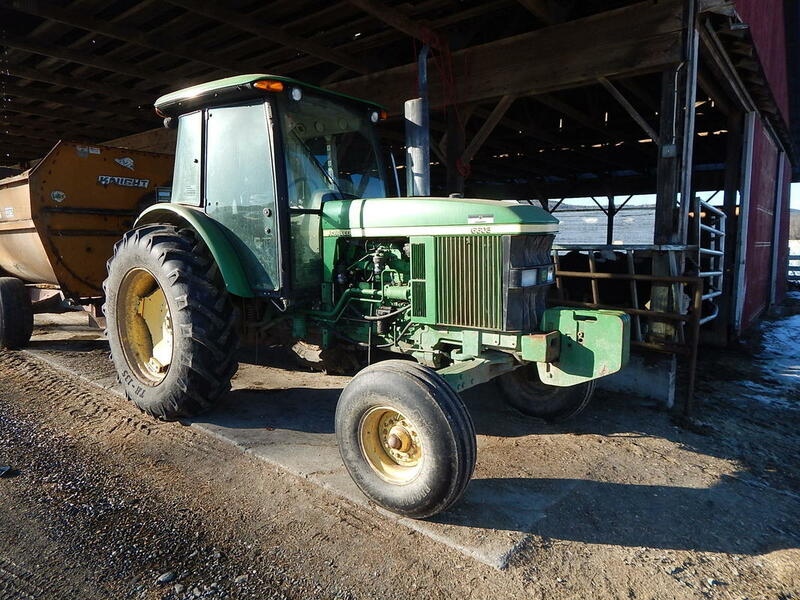 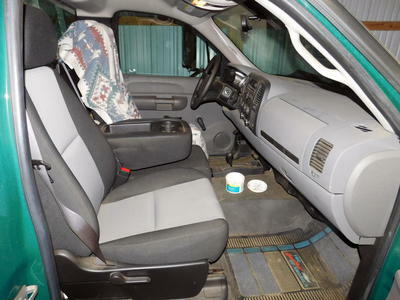 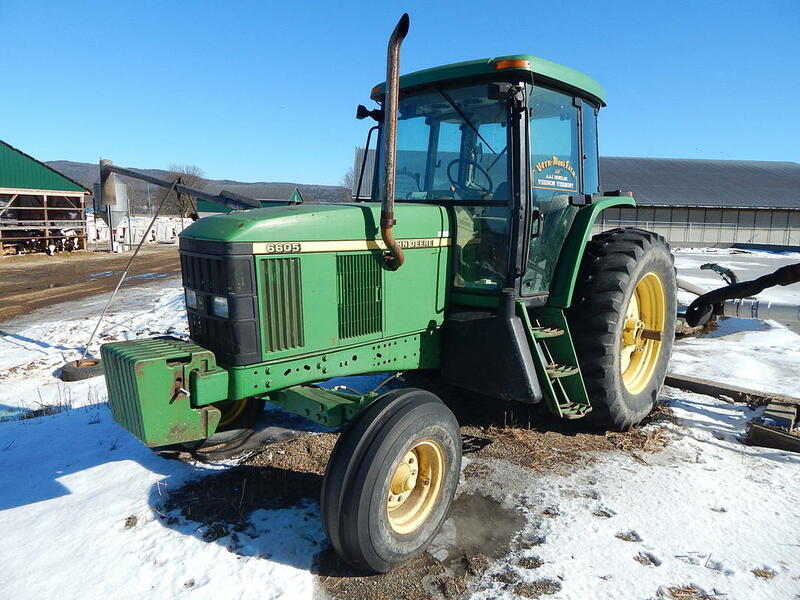 Consigned from neighboring farms and a local Estate: JD 8200 4x4-cab-duals-6000 hrs-sells with reserve, JD 7420 4x4-cab-741 loader-one owner-7300 hrs, JD 6115D 4x4-cab-1 owner-1200 hrs like new, JD 6605 2wd-cab-1 owner-9300 hrs, JD 4440-cab-quad, Kubota M120DTC 4x4-cab-loader-6285 hrs, JD 2020 diesel, 2008 Chev 3500-4x4-Pro Tech alum flat bed with gooseneck hookup-gas-auto-8287 miles-no rust like new, 1988 Featherlite 24' alum gooseneck cattle trailer, 1986 Donahue gooseneck flat bed dump trailer, 1987 Int 2674 with 19' alum body, Krone Combi-Pack multi cut 1250 round baler with net & plastic wrap and built in wrapper, Teagle Tomahawk 4040 3pth round bale shredder, JD 972 flail chopper, 2 Diller 24' pasture feed wagons, Hagedorn 5440 tandem hydro push spreader-2 years old like new, JD 946 Hydro Swing disc mower, King Cutter 5' 3pth rototiller, Kodiak 5' bush hog, Lincoln portable welder with leads. 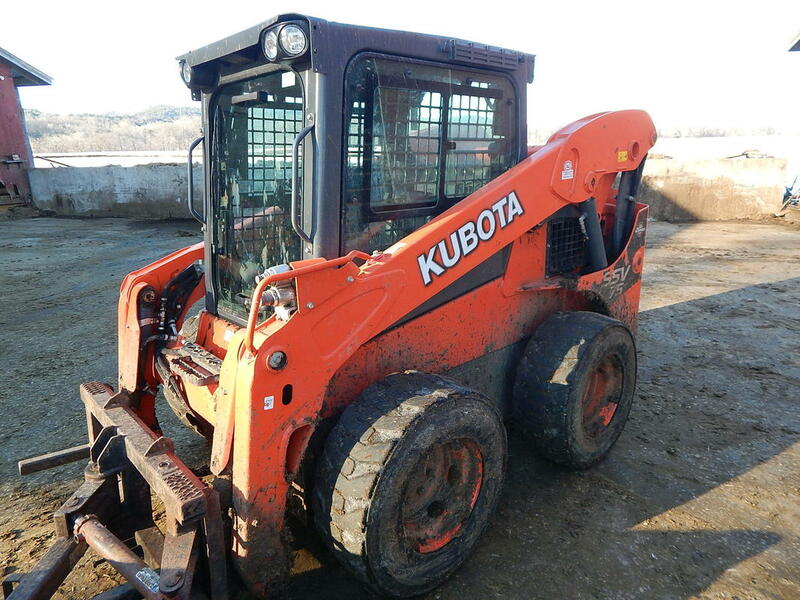 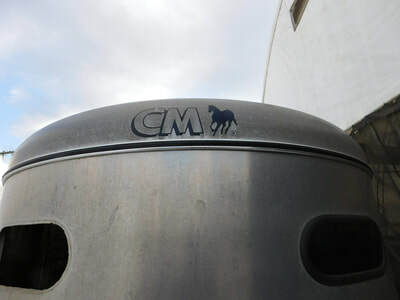 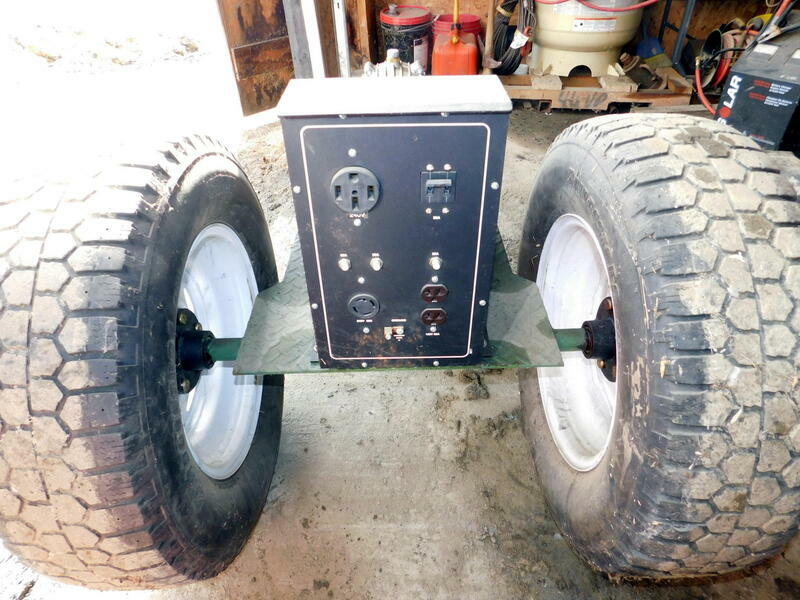 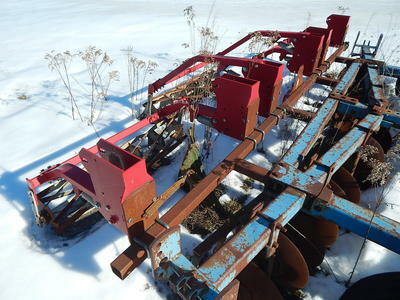 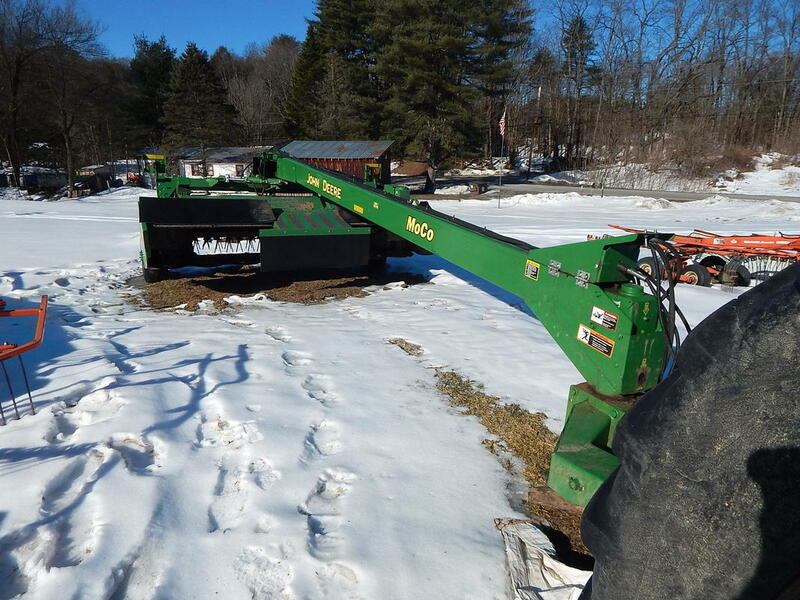 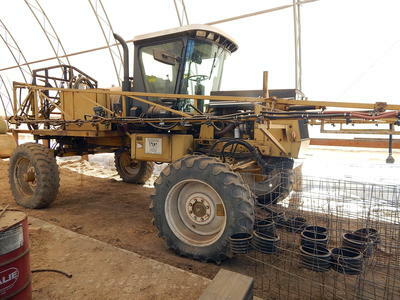 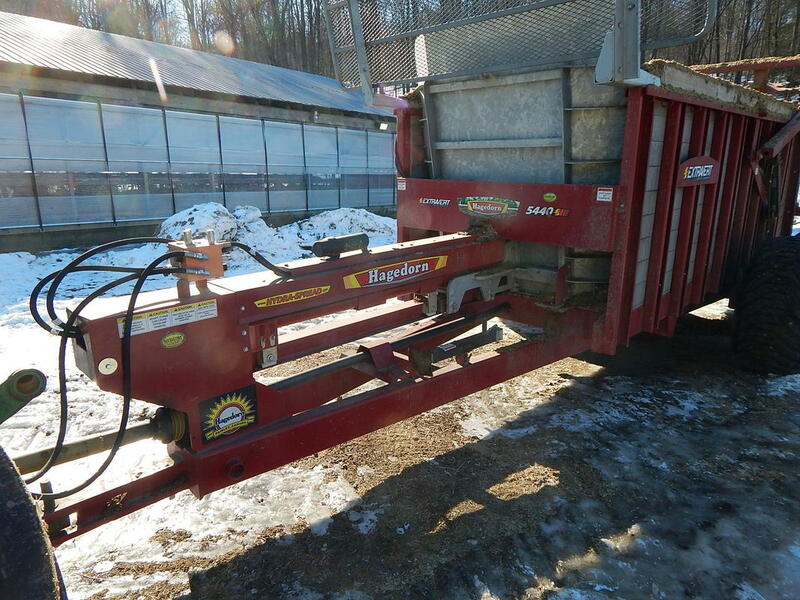 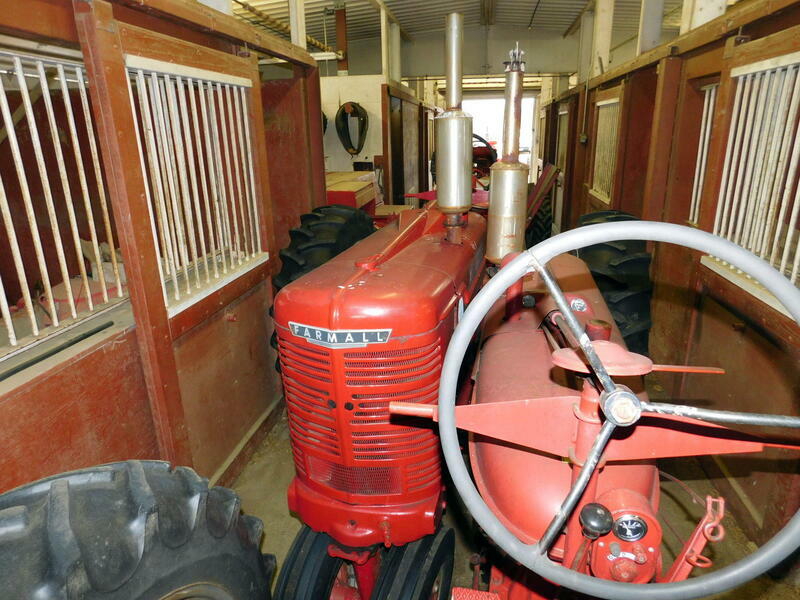 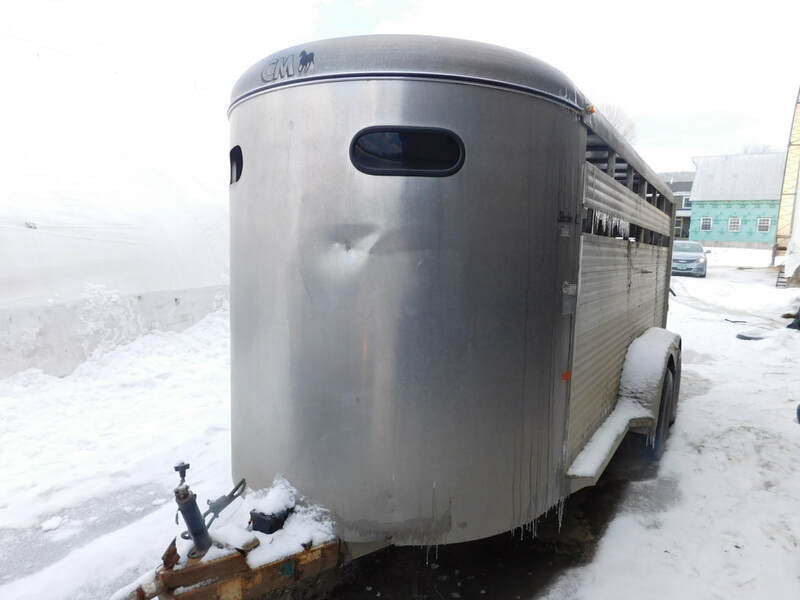 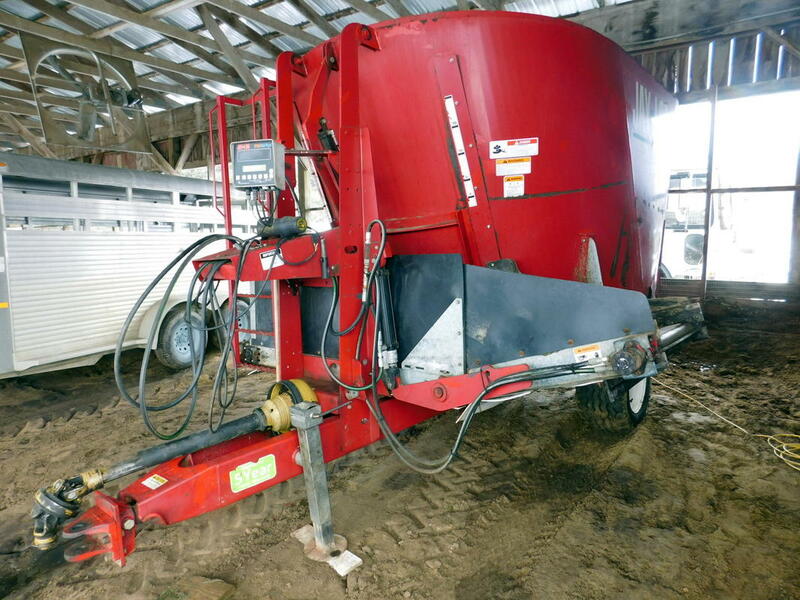 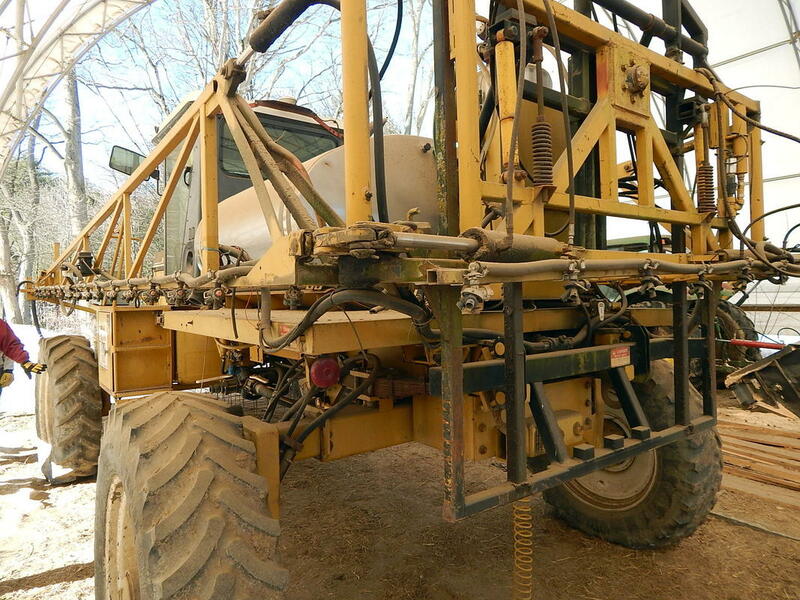 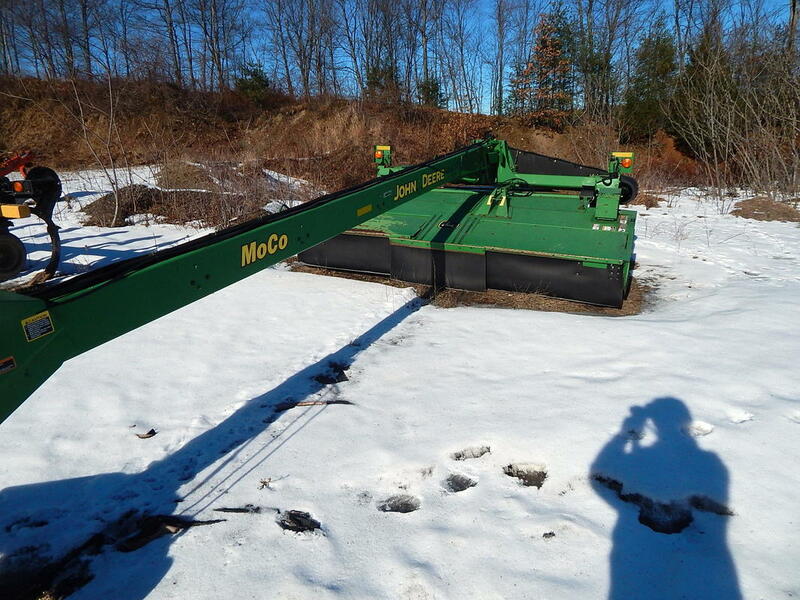 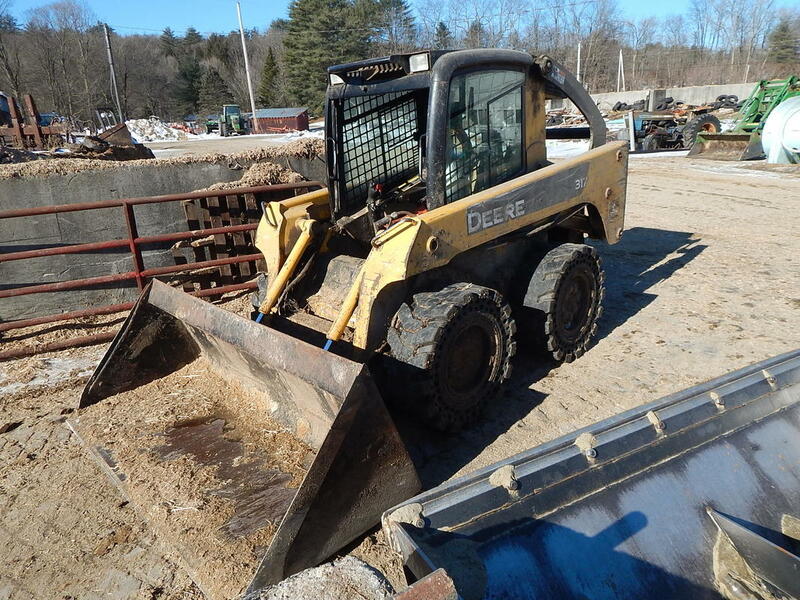 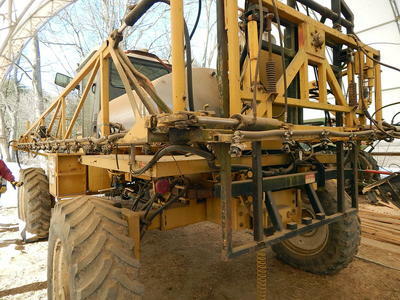 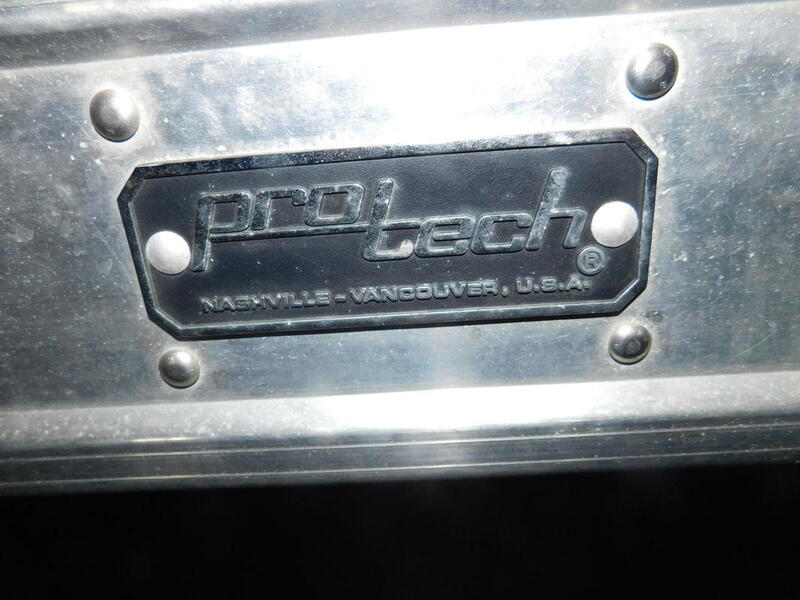 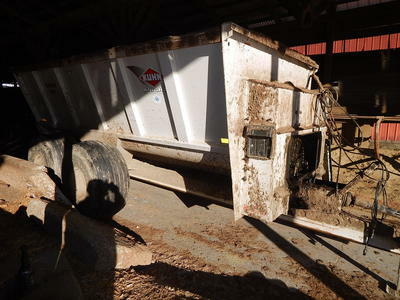 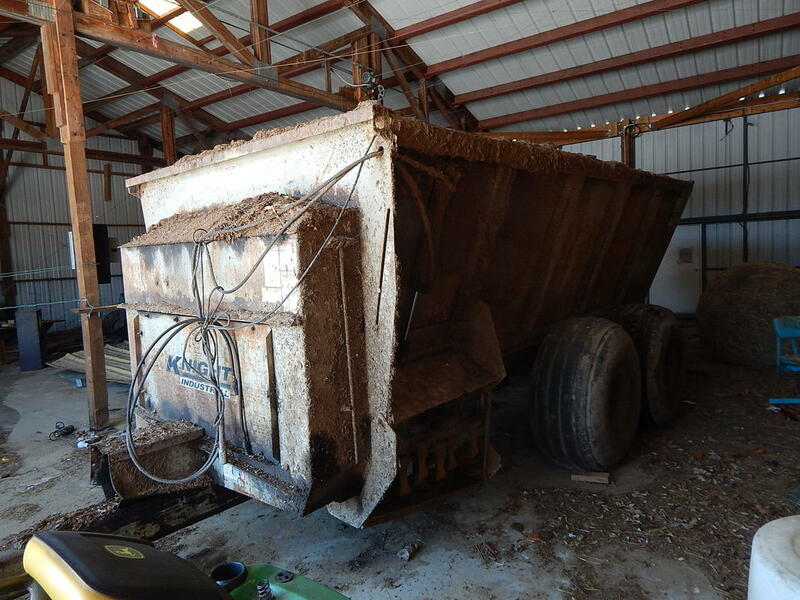 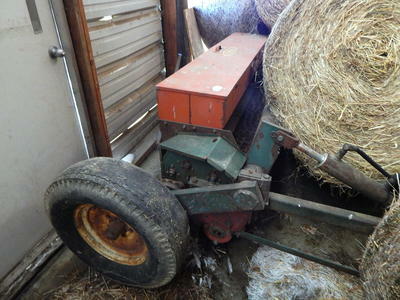 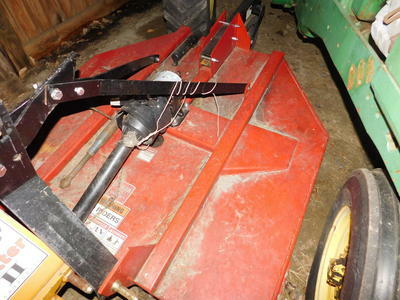 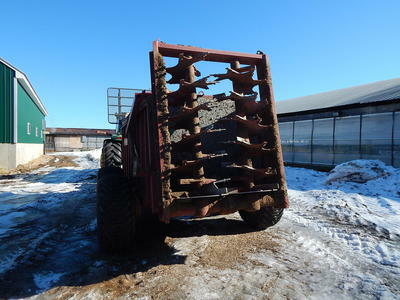 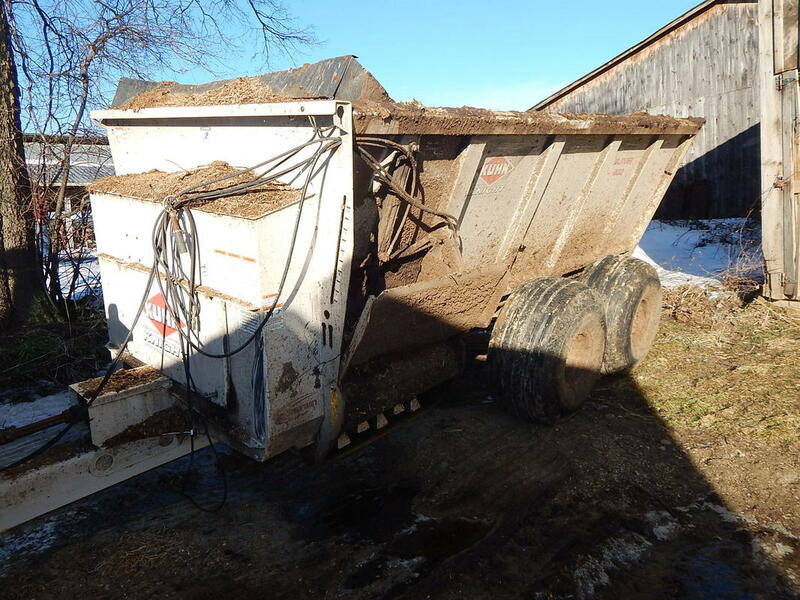 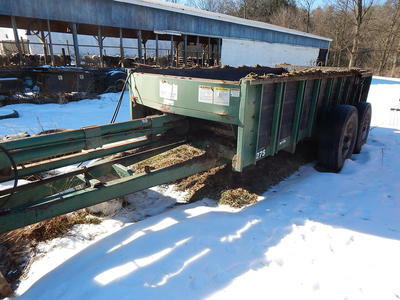 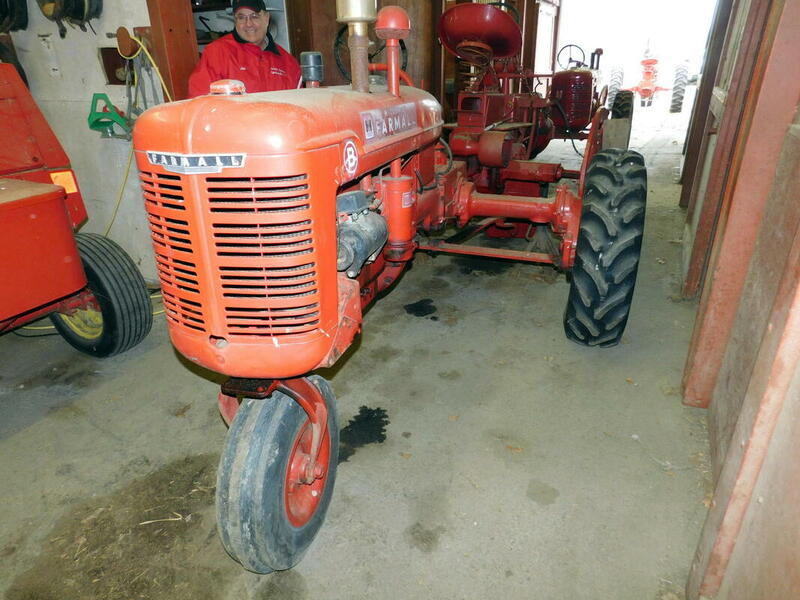 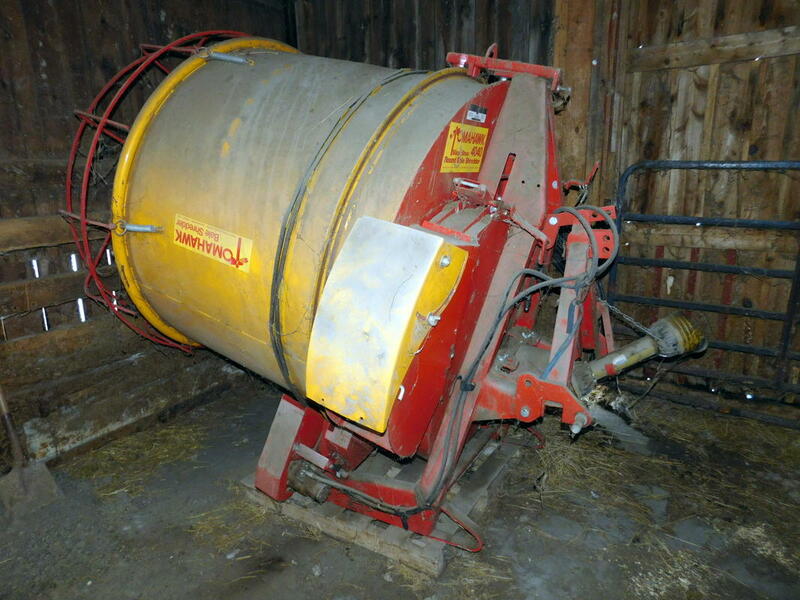 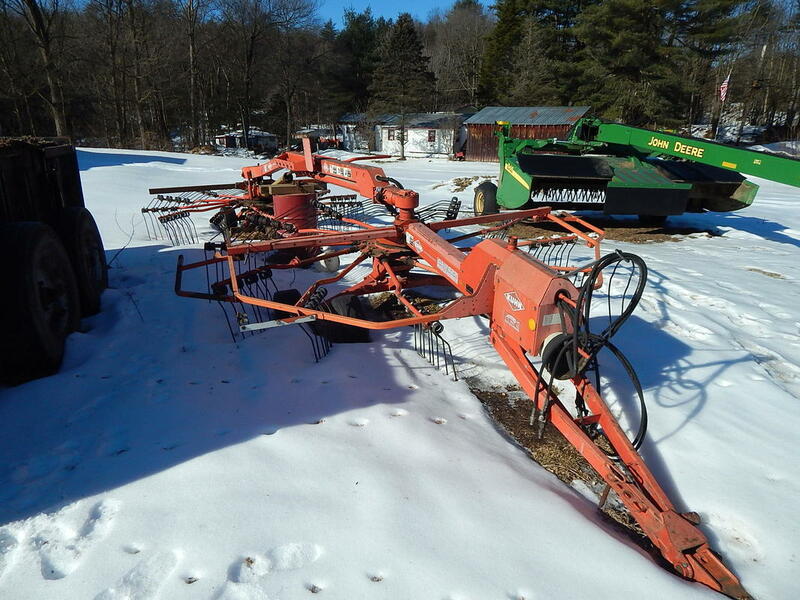 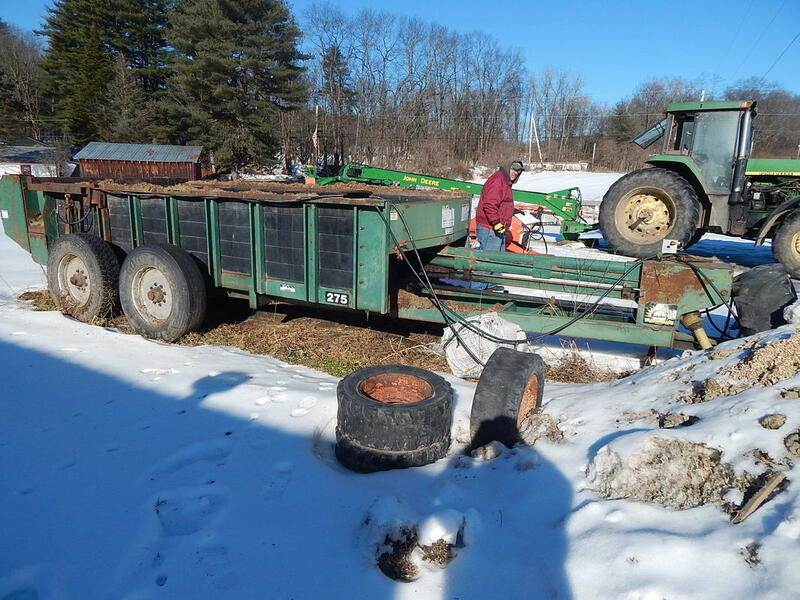 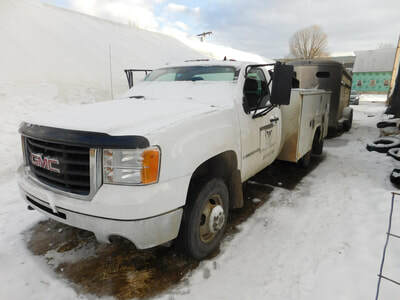 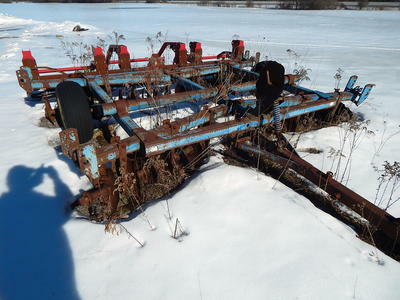 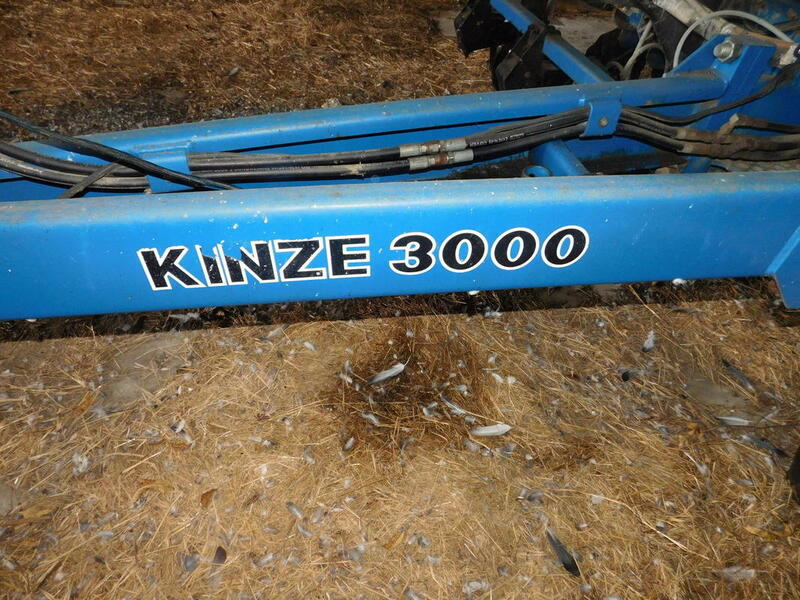 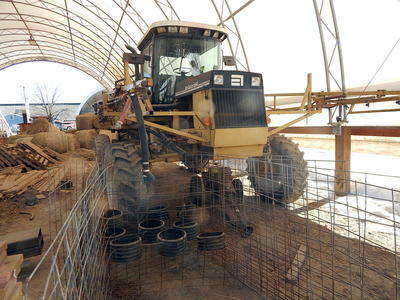 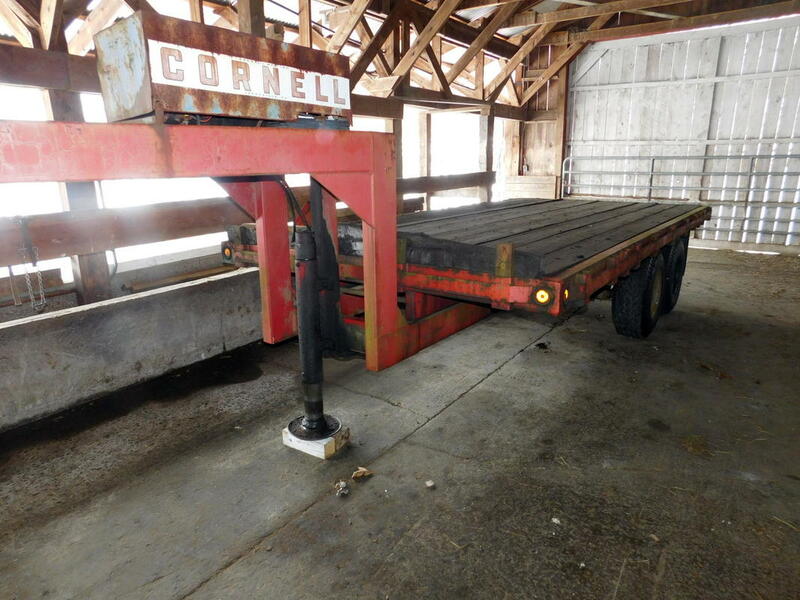 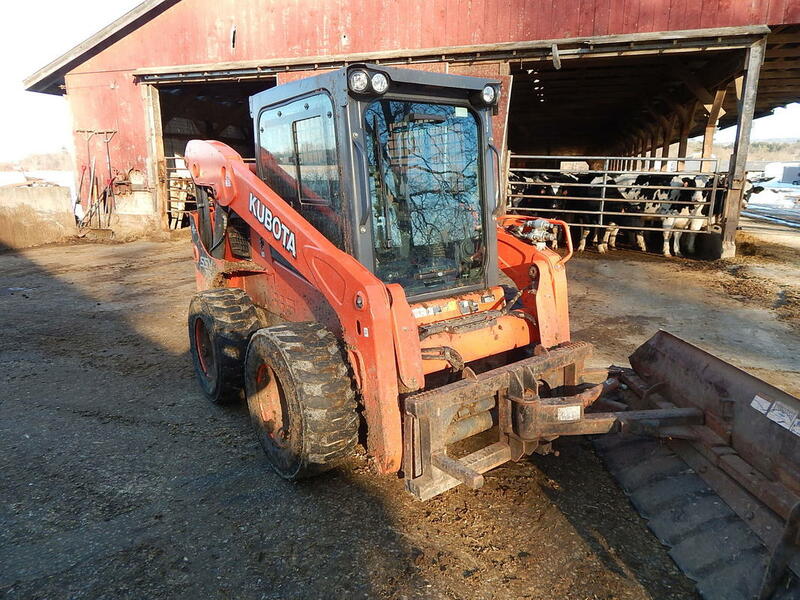 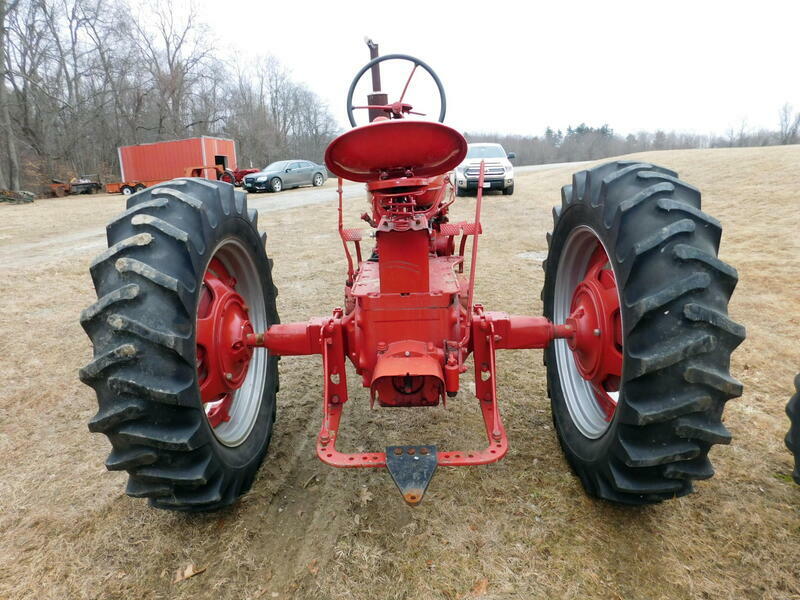 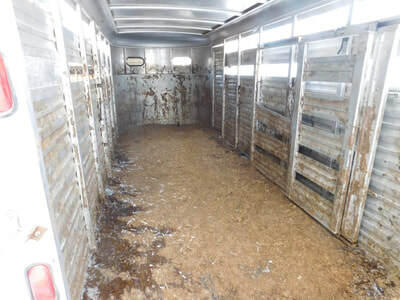 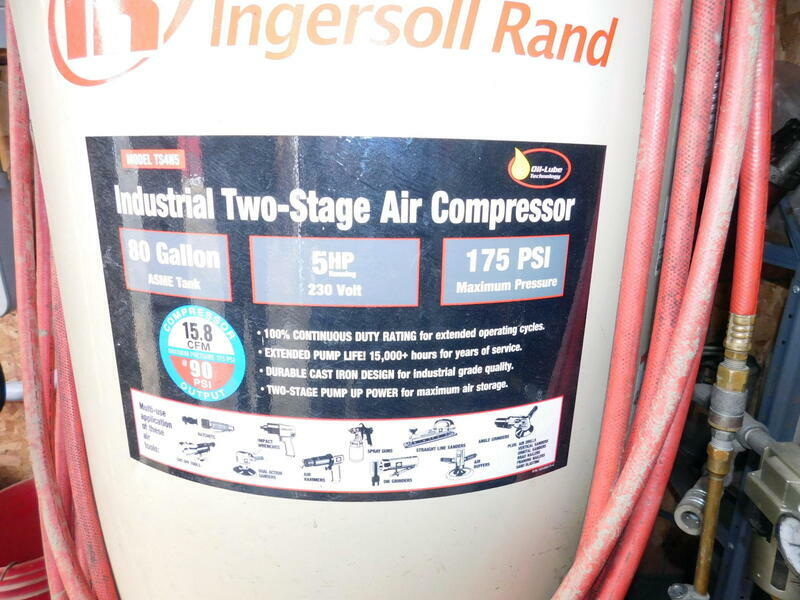 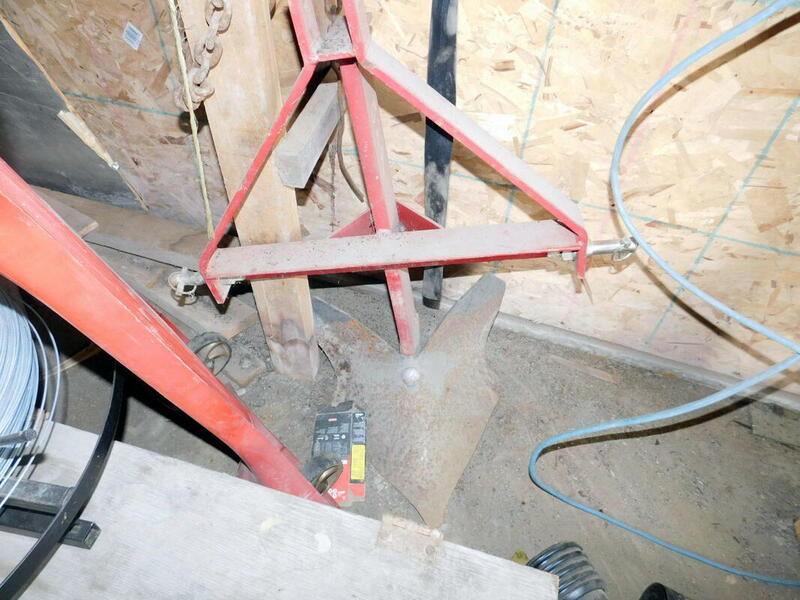 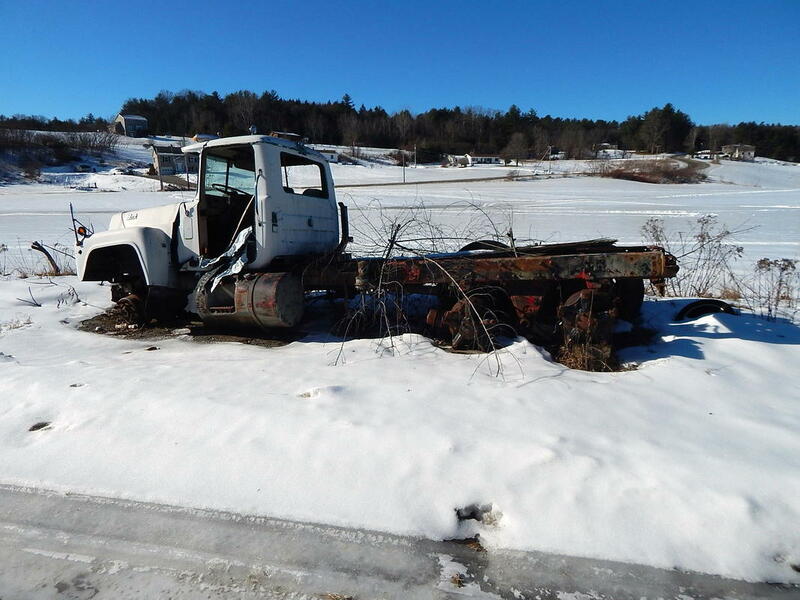 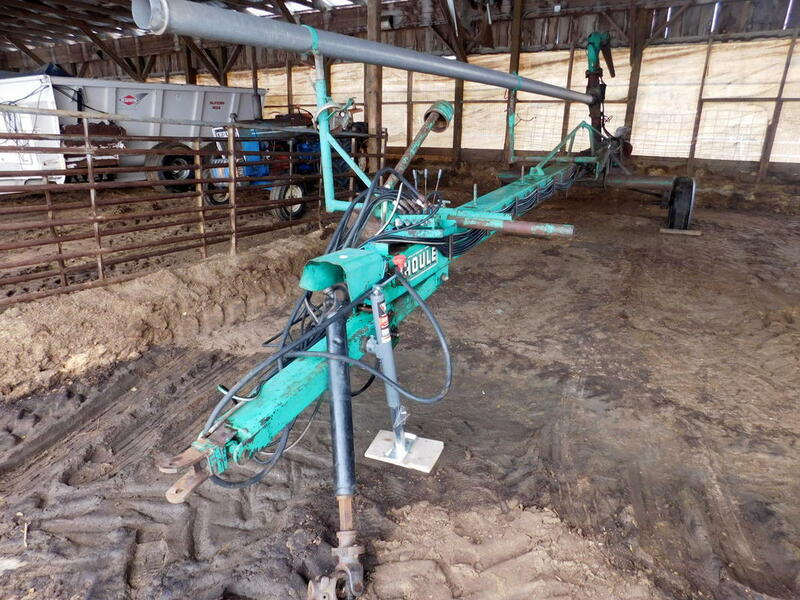 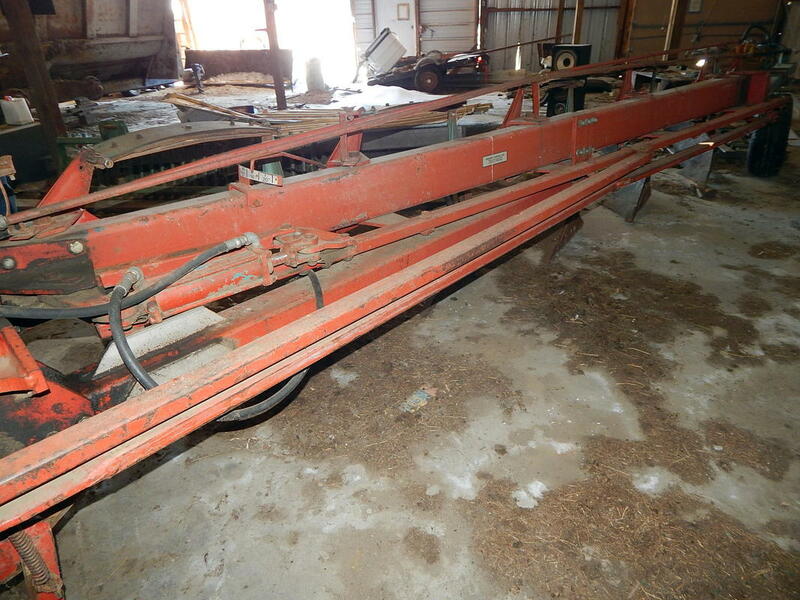 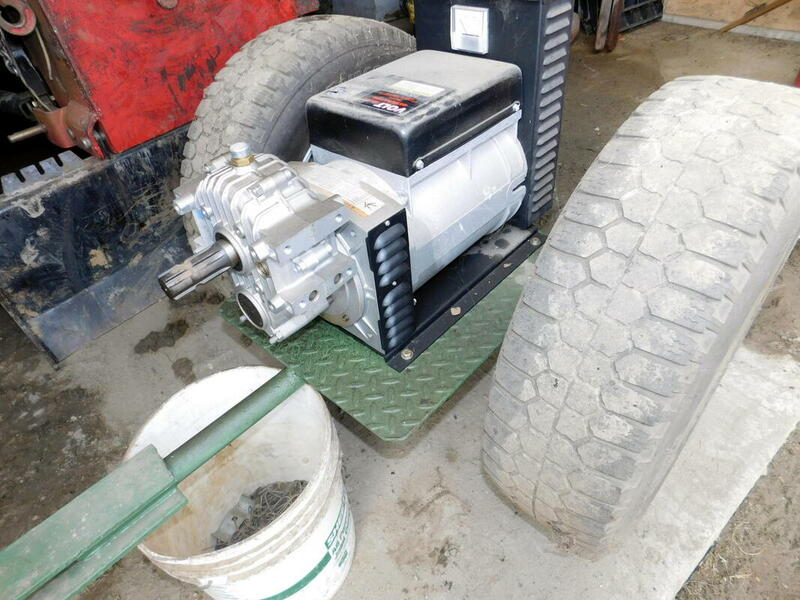 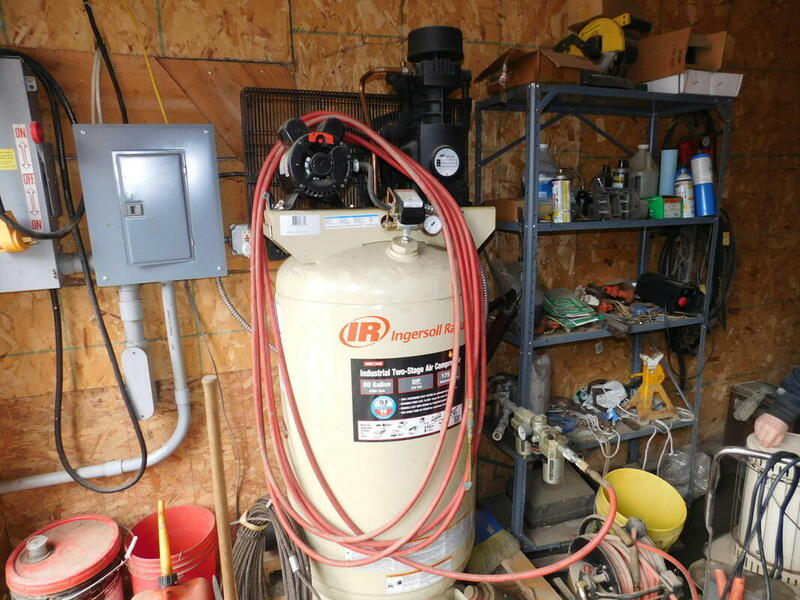 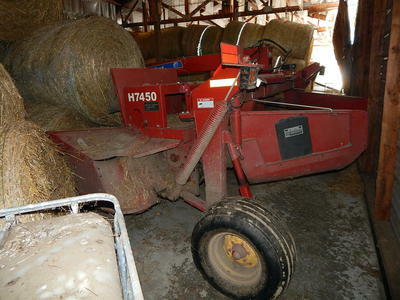 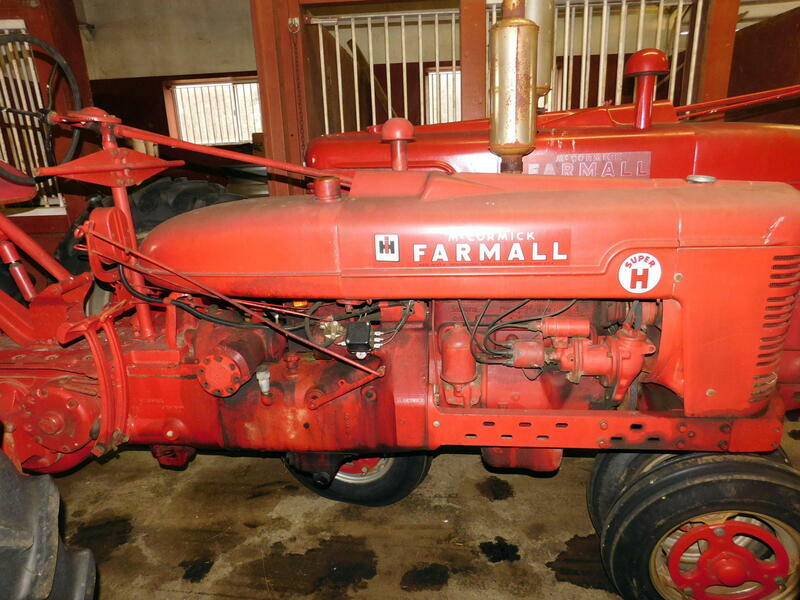 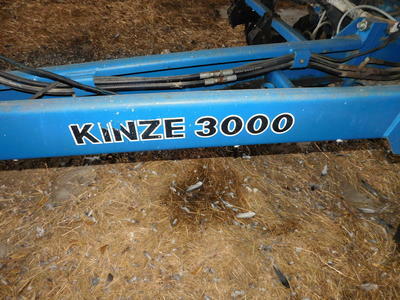 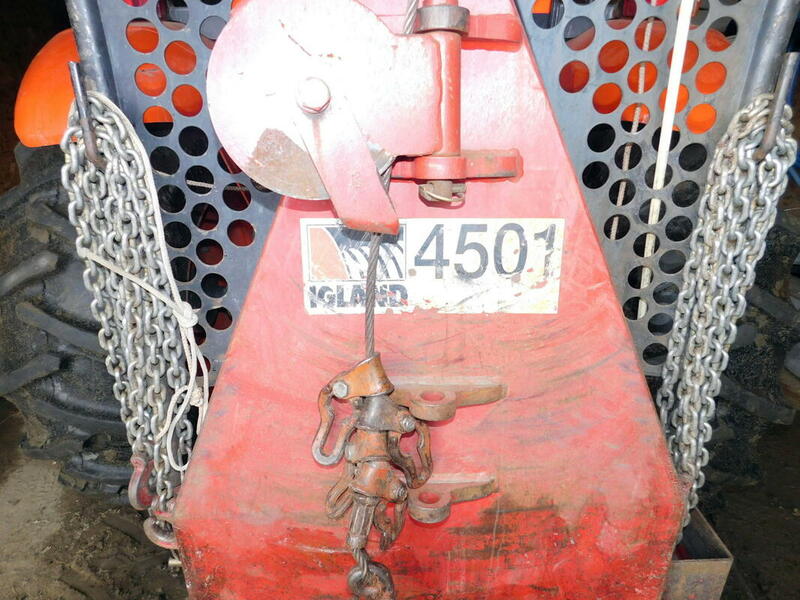 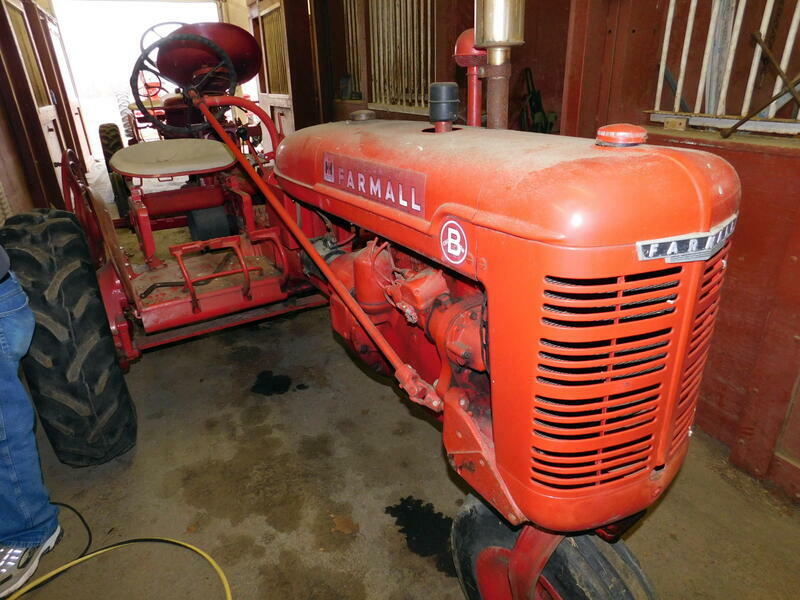 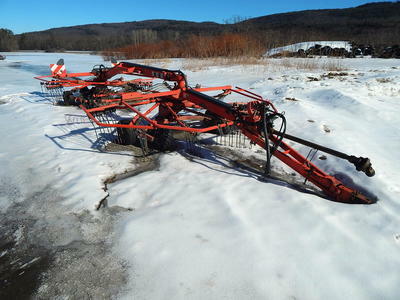 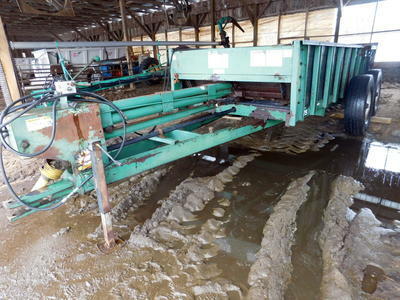 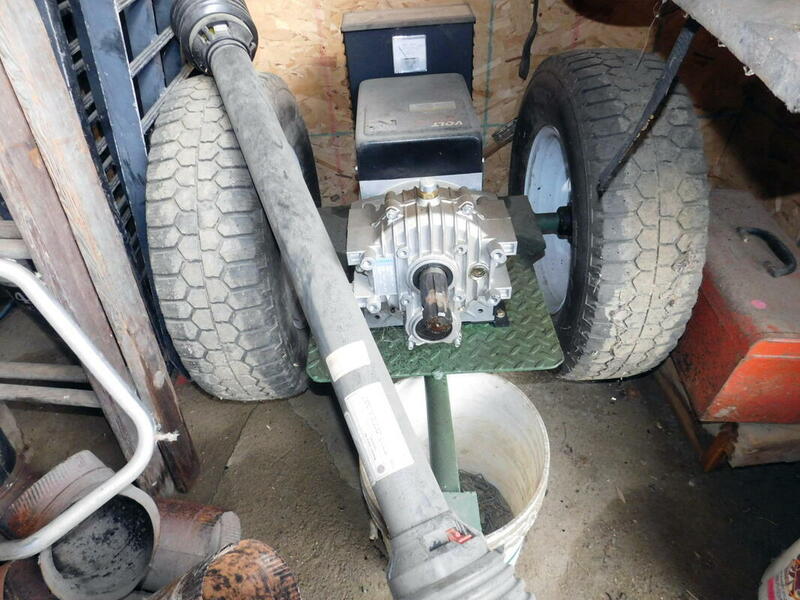 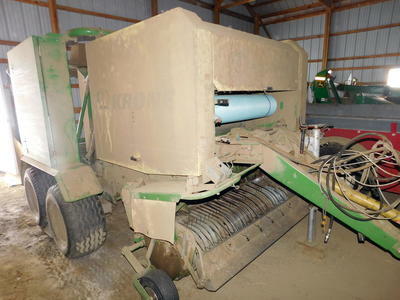 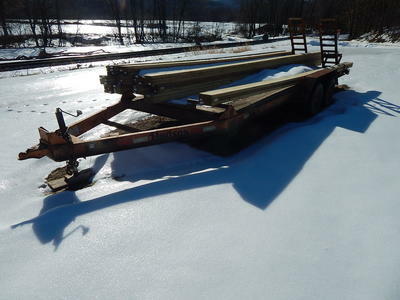 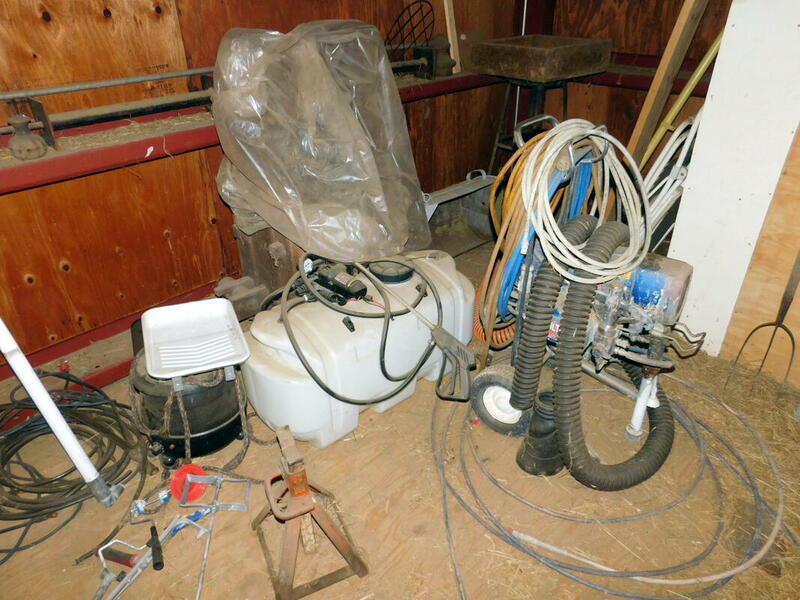 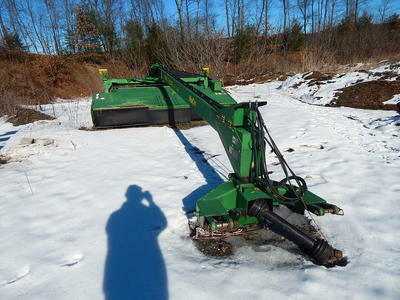 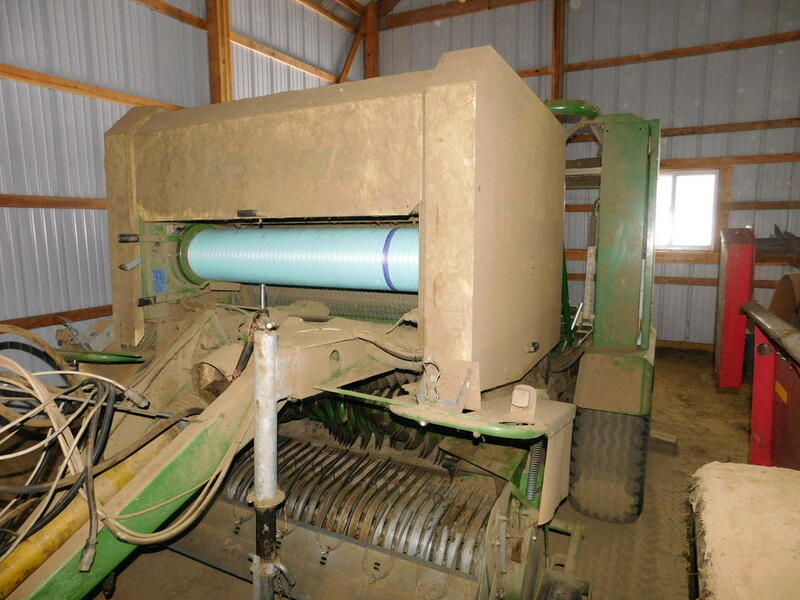 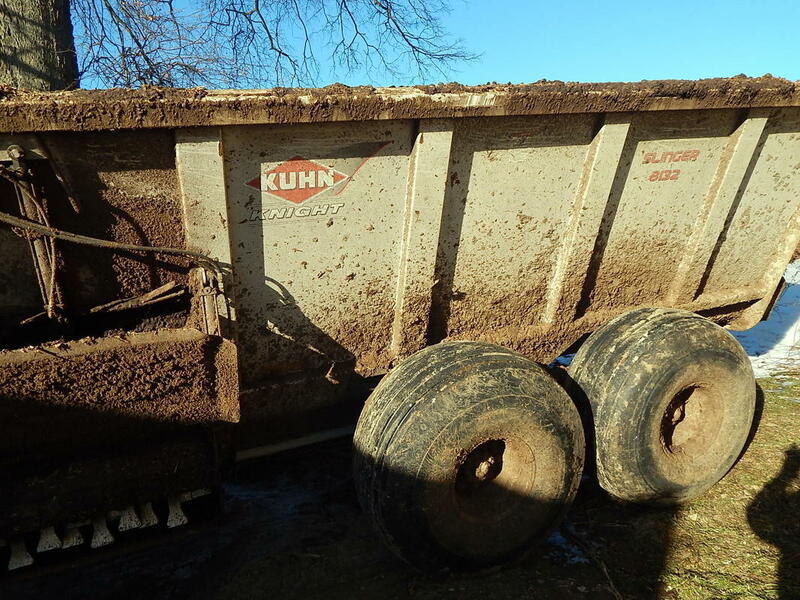 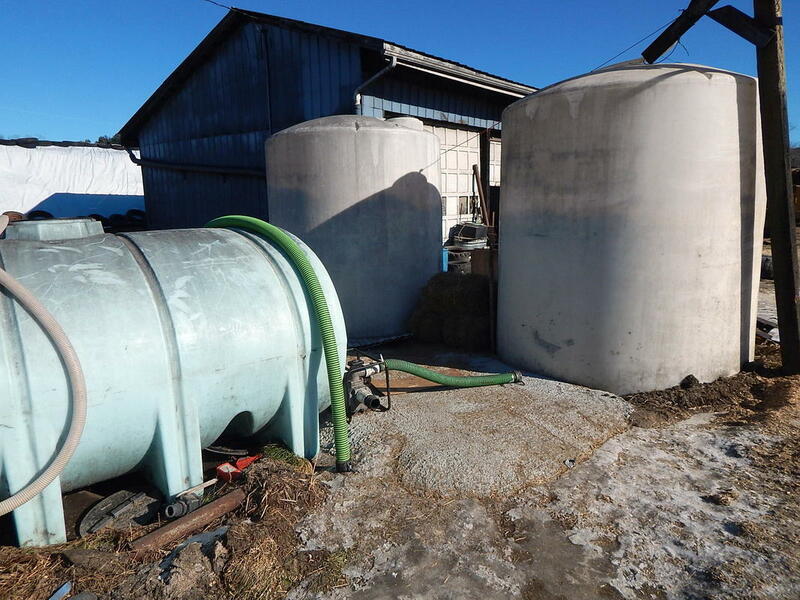 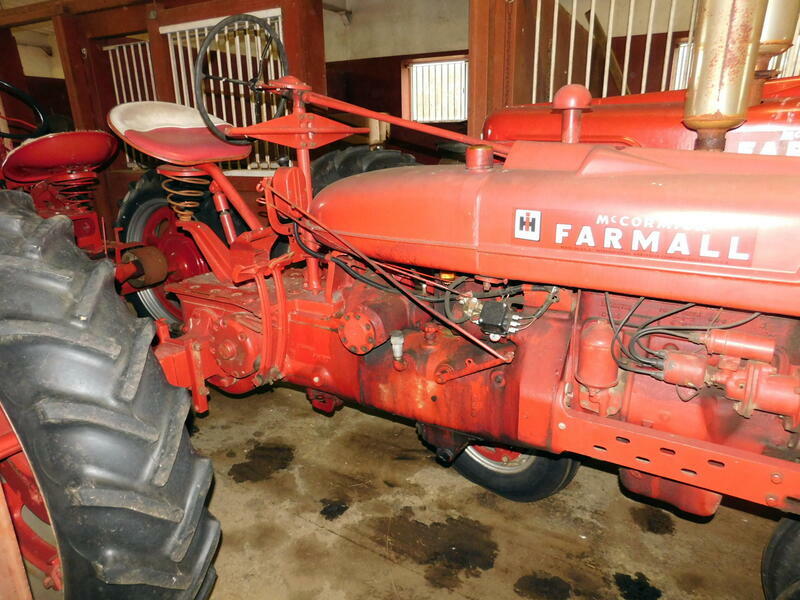 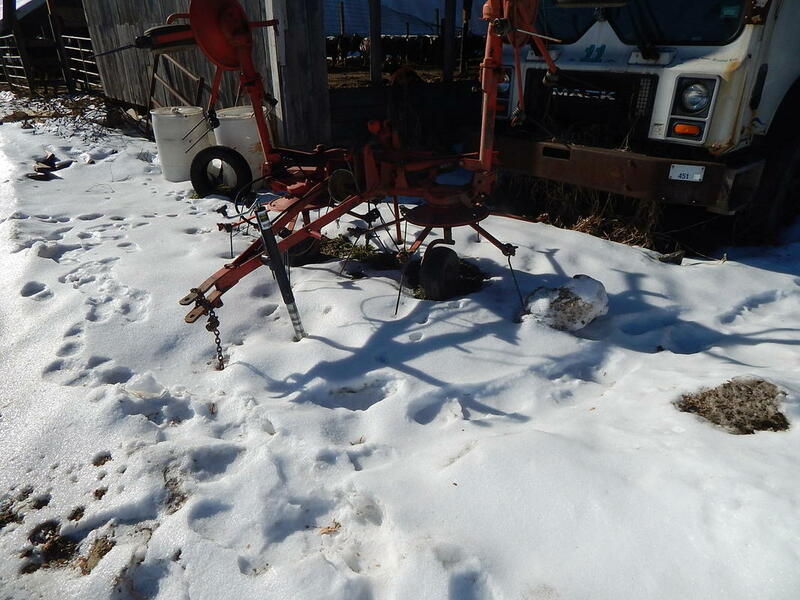 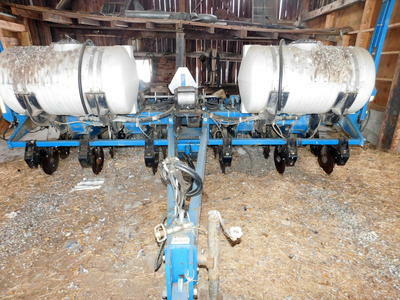 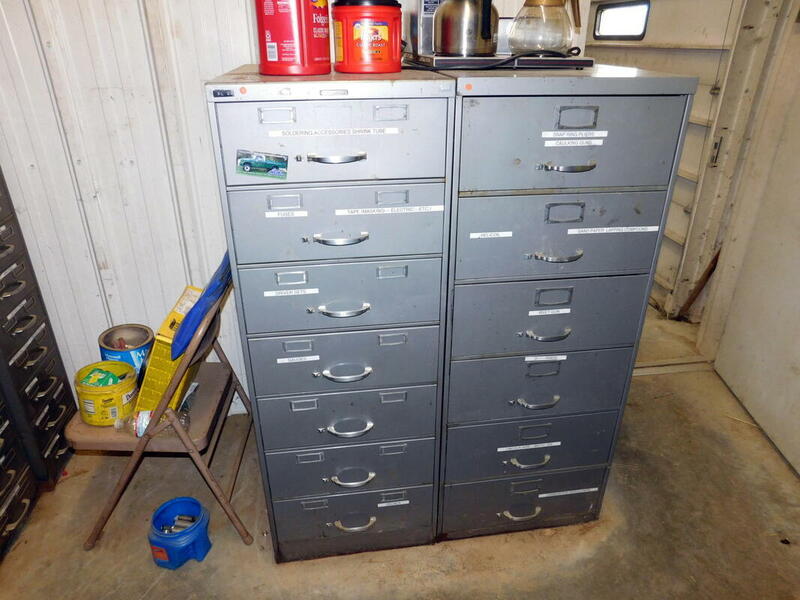 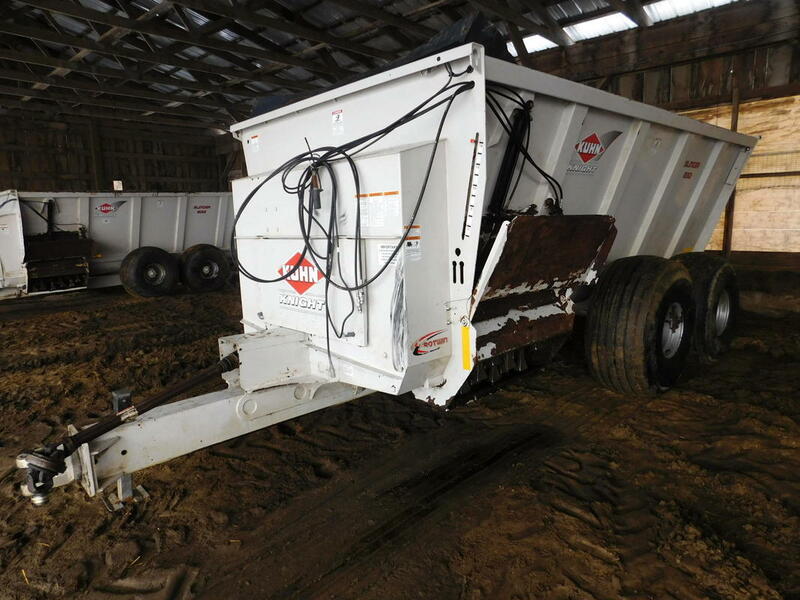 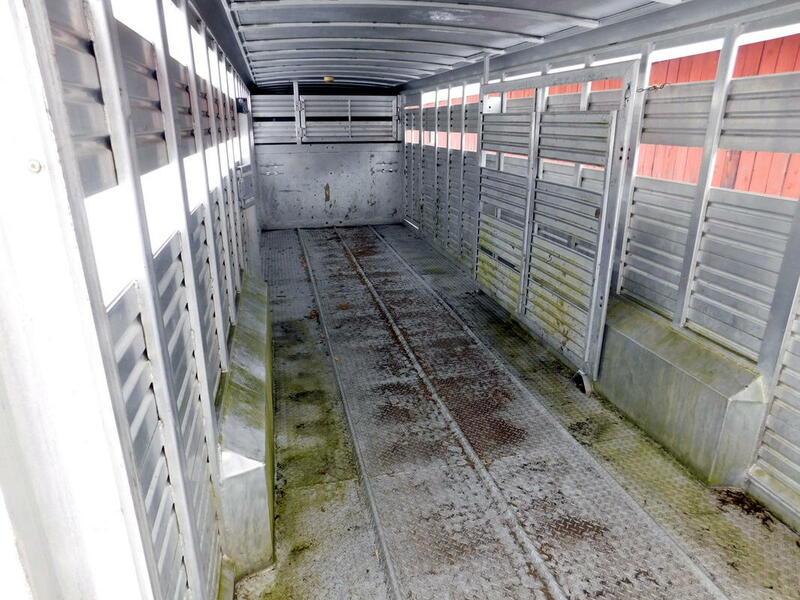 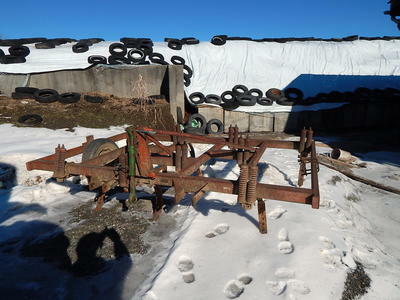 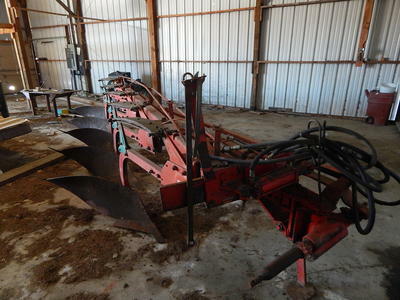 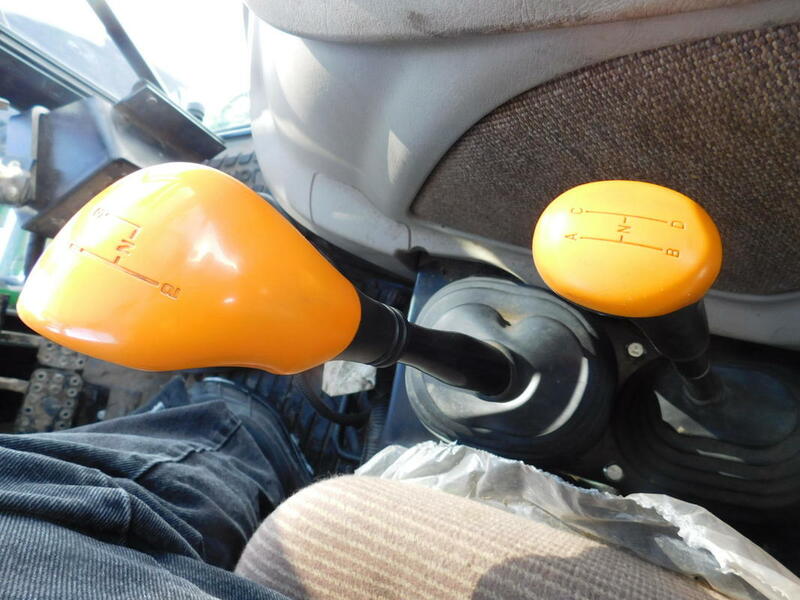 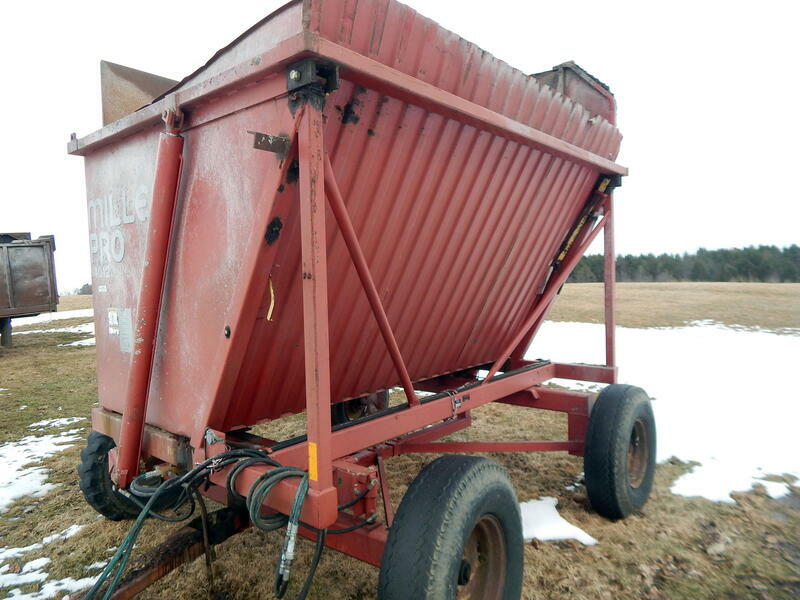 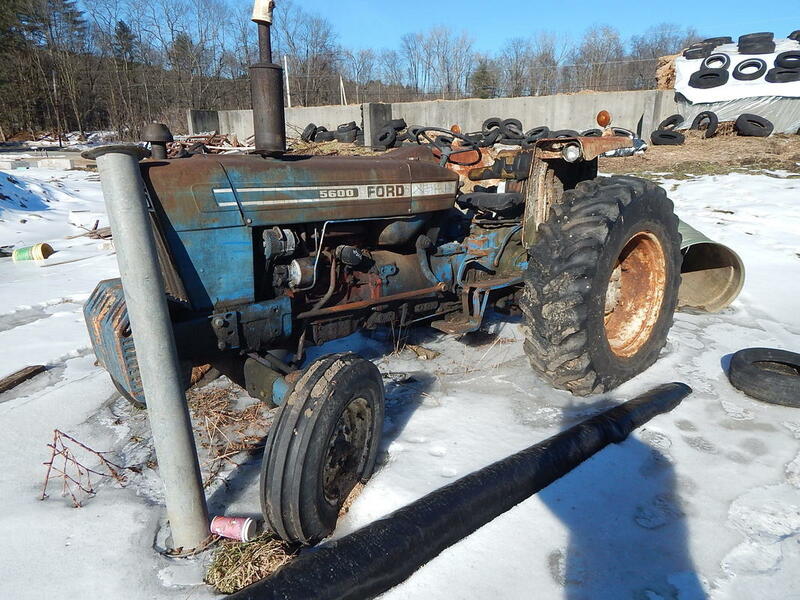 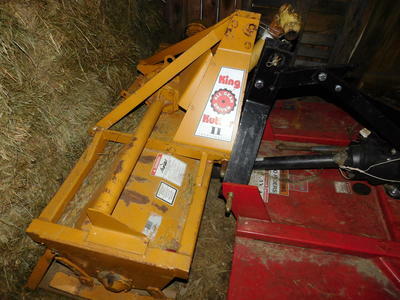 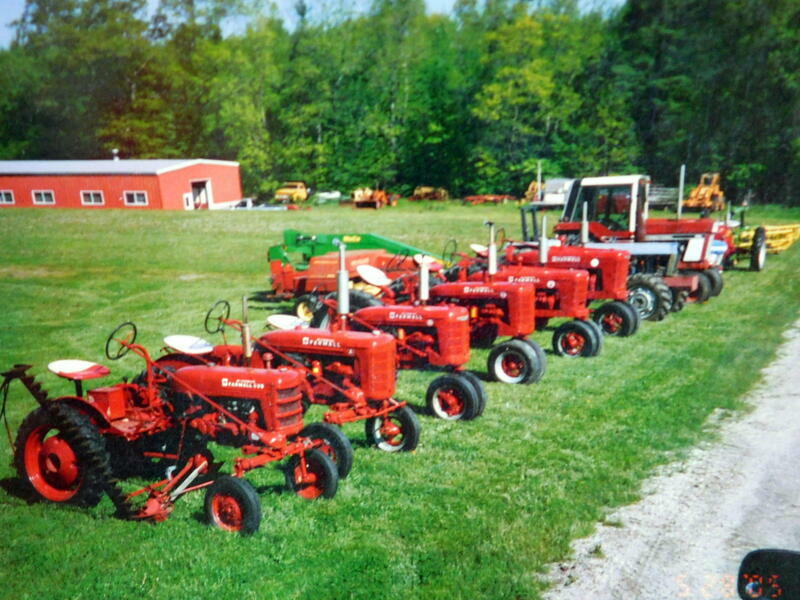 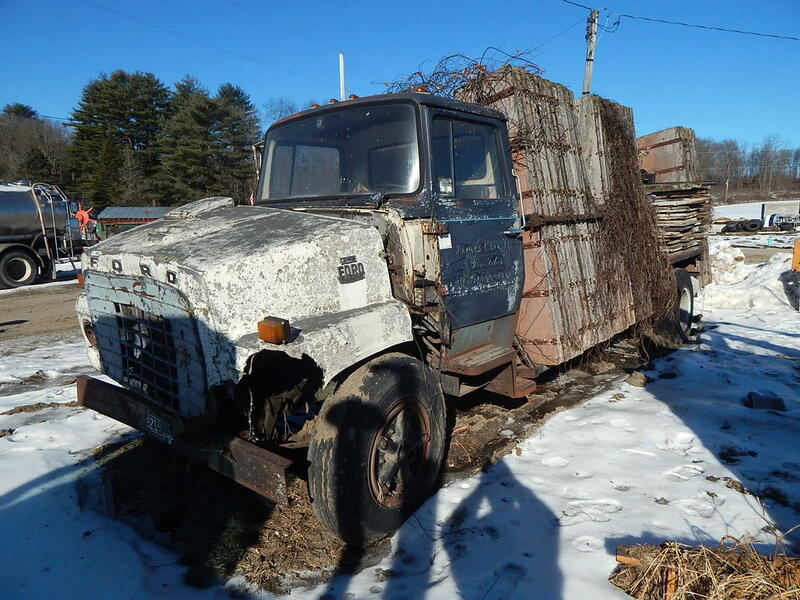 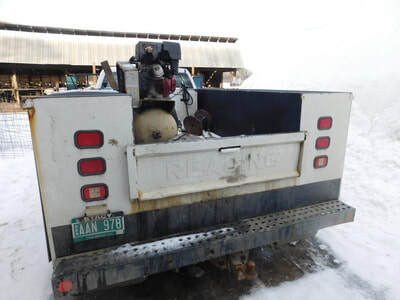 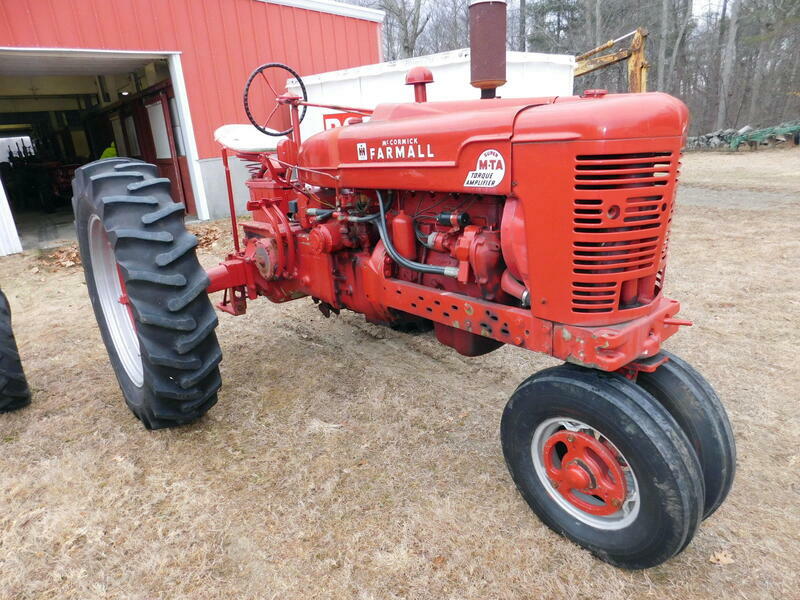 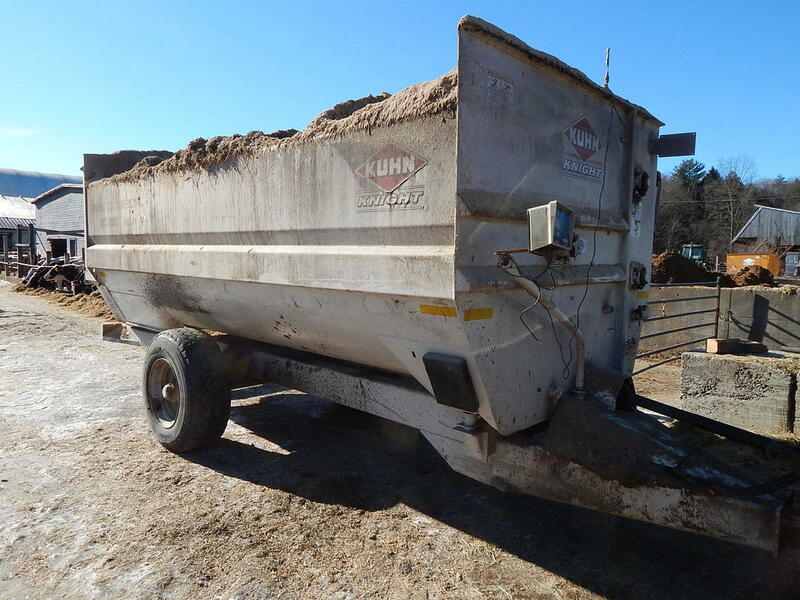 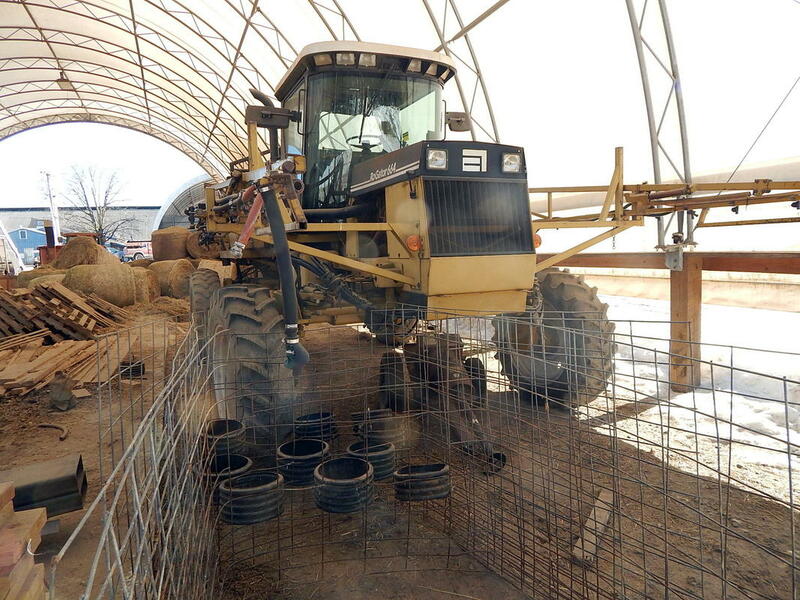 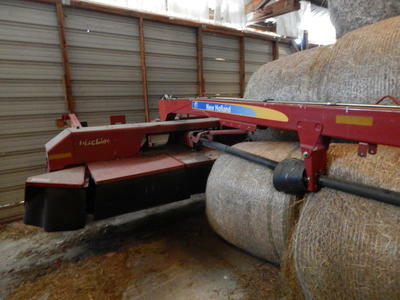 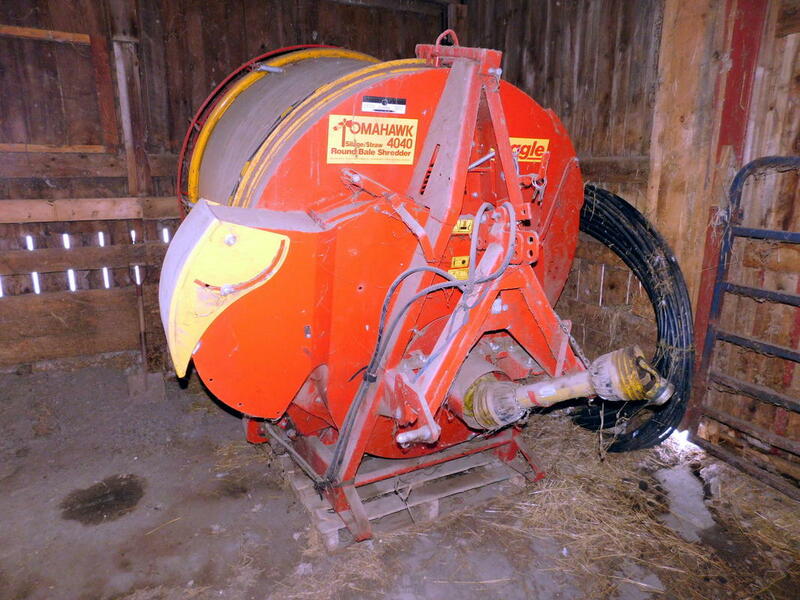 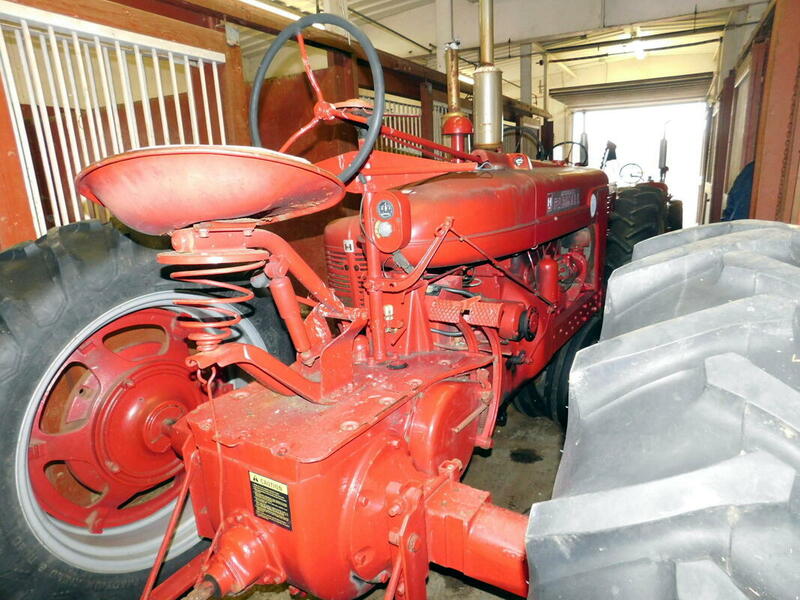 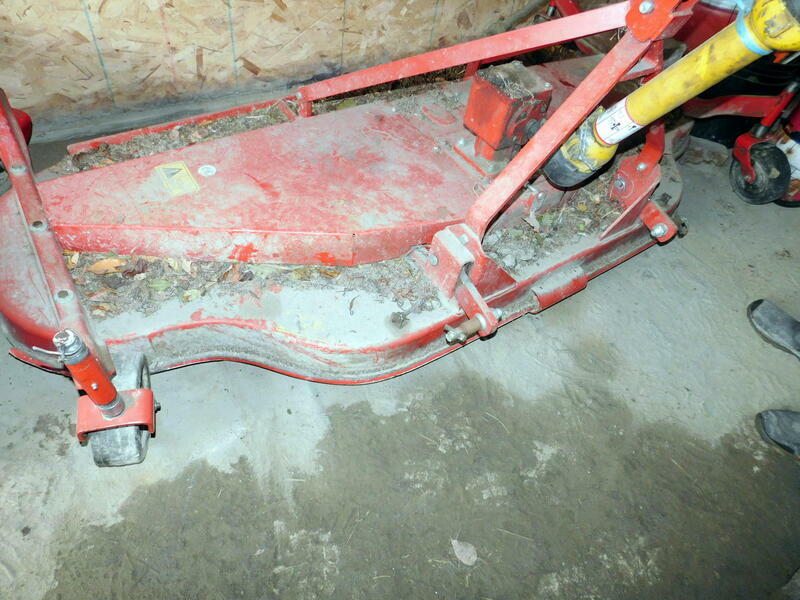 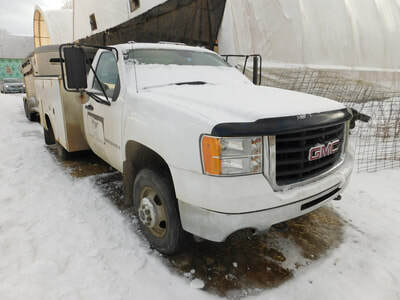 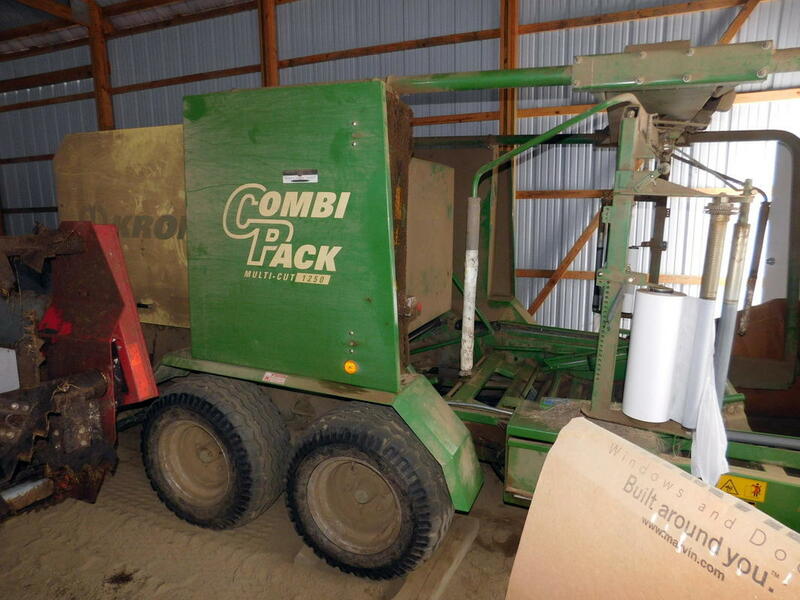 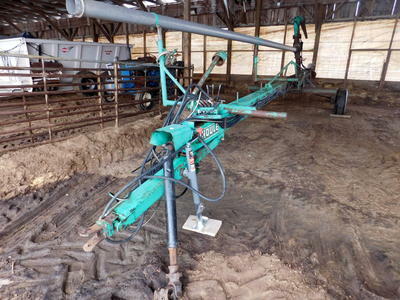 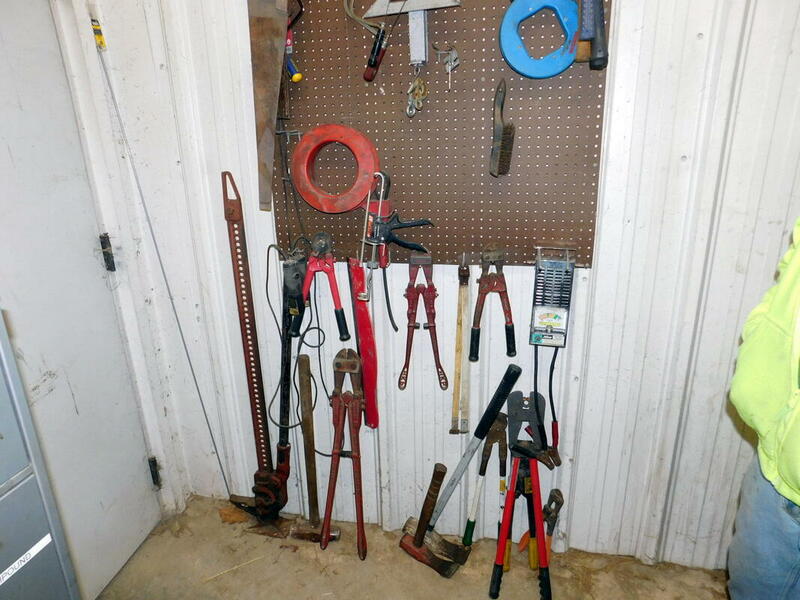 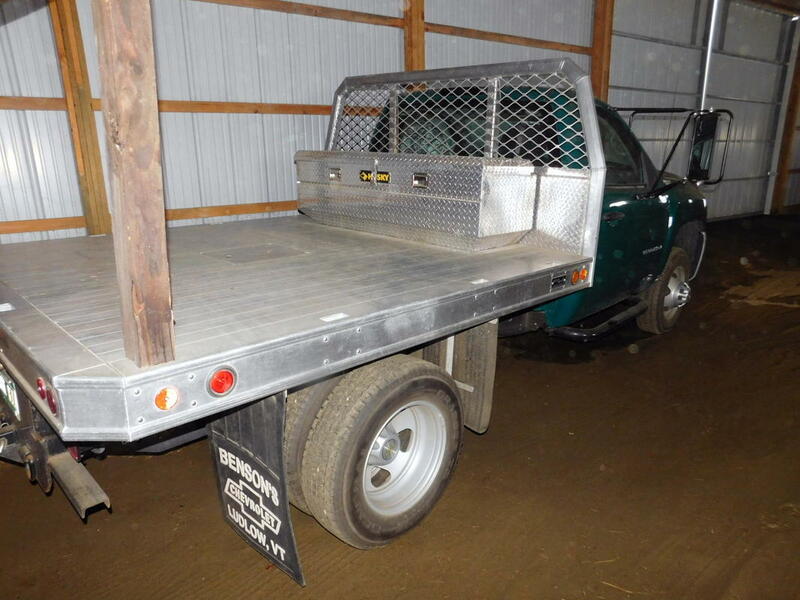 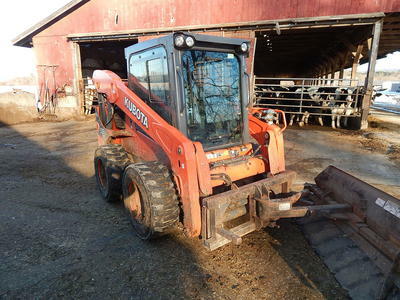 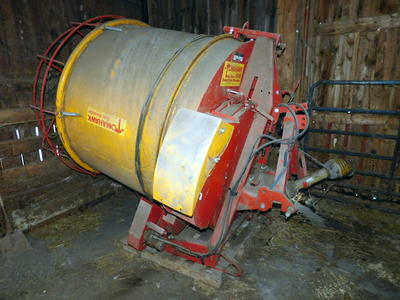 Excellent line of equipment that you can't find at auction. 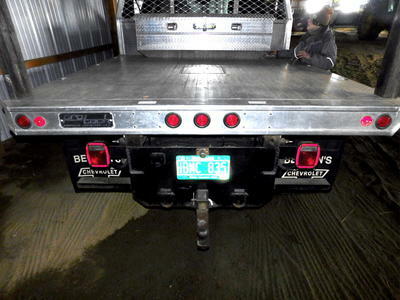 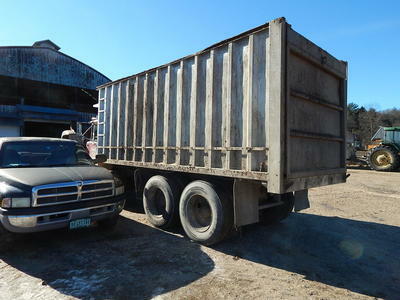 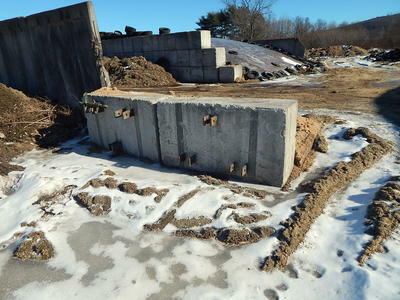 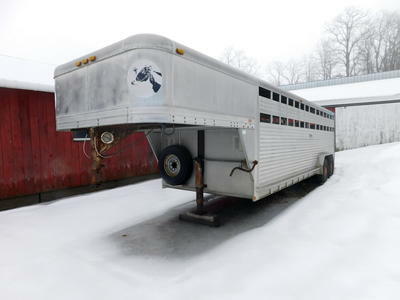 Owner: Mike Barrett Putney, Vt, 802-579-4739 Several hotels located in Brattleboro, Vt.